Chan Dara was my go to place, walking distance from where I used to live. When I came back to the US, I was saddened to see the restaurant was gone and replaced by new construction, even though changes can sometimes bring great new experiences. 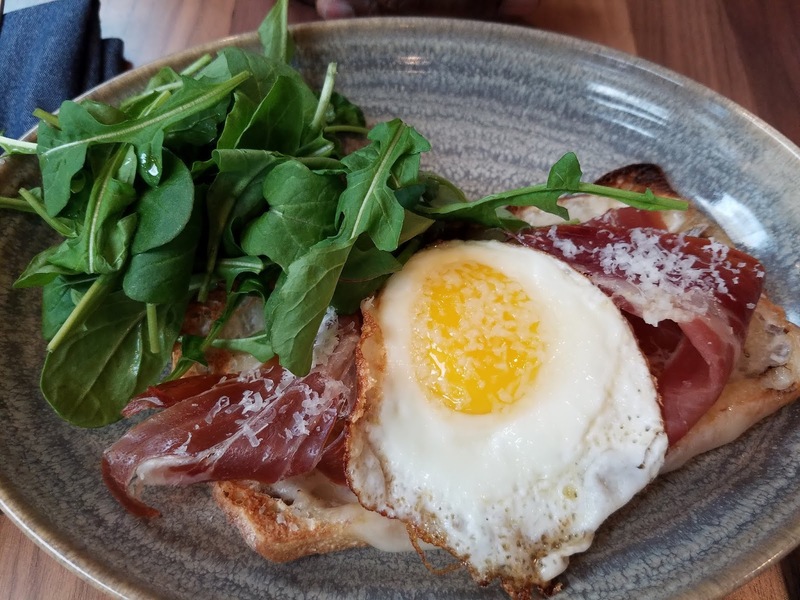 Pikoh has opened and already become my new favorite spot in West Los Angeles for coffee, breakfast, brunch, and lunch. I will be trying their dinner menu soon and will keep you posted as I eat my way through their new all day menu. 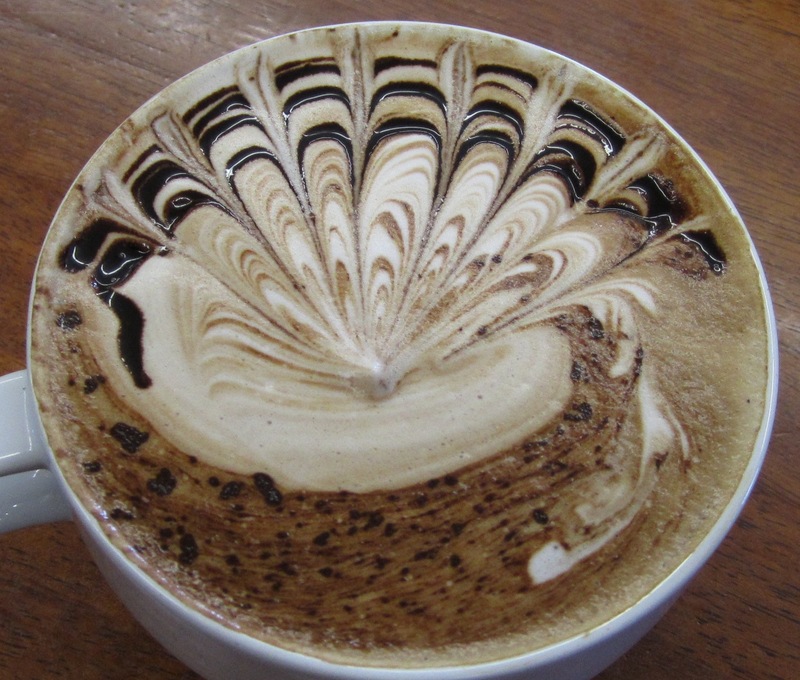 Depending on your barista, you may get your coffee with some beautiful art! They serve some of the best coffee in the area, and drinking it from well made ceramic cups makes it an even more enjoyable experience. 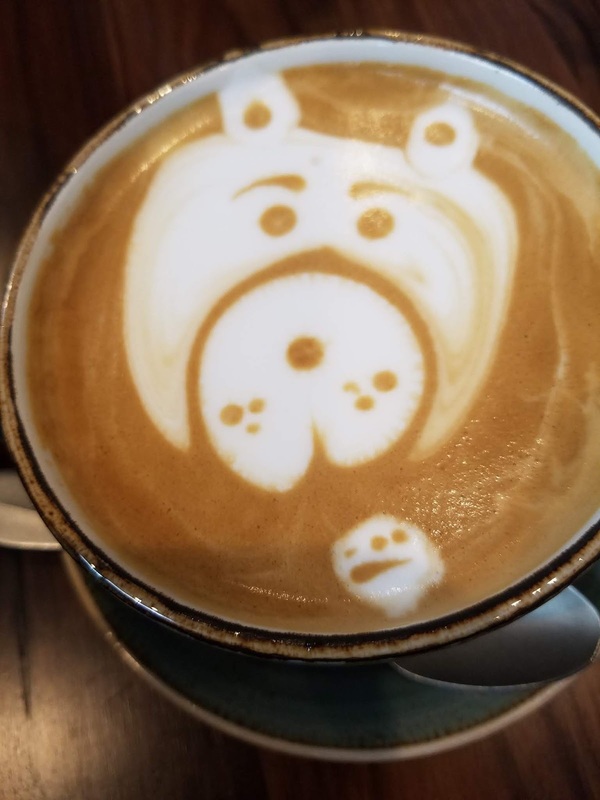 My coffee partner usually adds sugar, but drank the latte here with no sweetner because it was so smooth and satisfying. They offer table service in the evening and during brunch on the week-ends, otherwise you order at the counter and take a number. 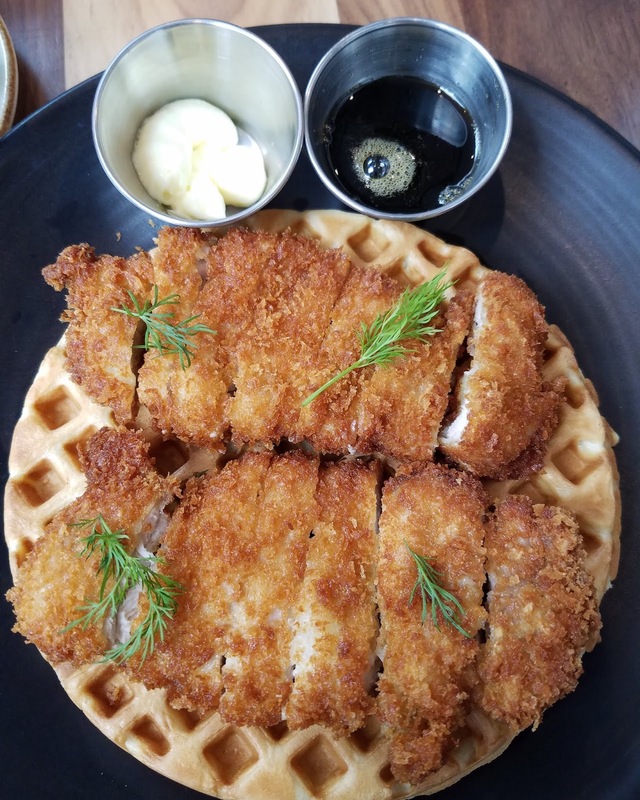 They have some new additions to their brunch menu, as well as old standards like fried jidori chicken and waffle for $16. The chicken was fabulous, crunchy, moist, and perfect, but sadly the waffle was a bit too thick and underdone. 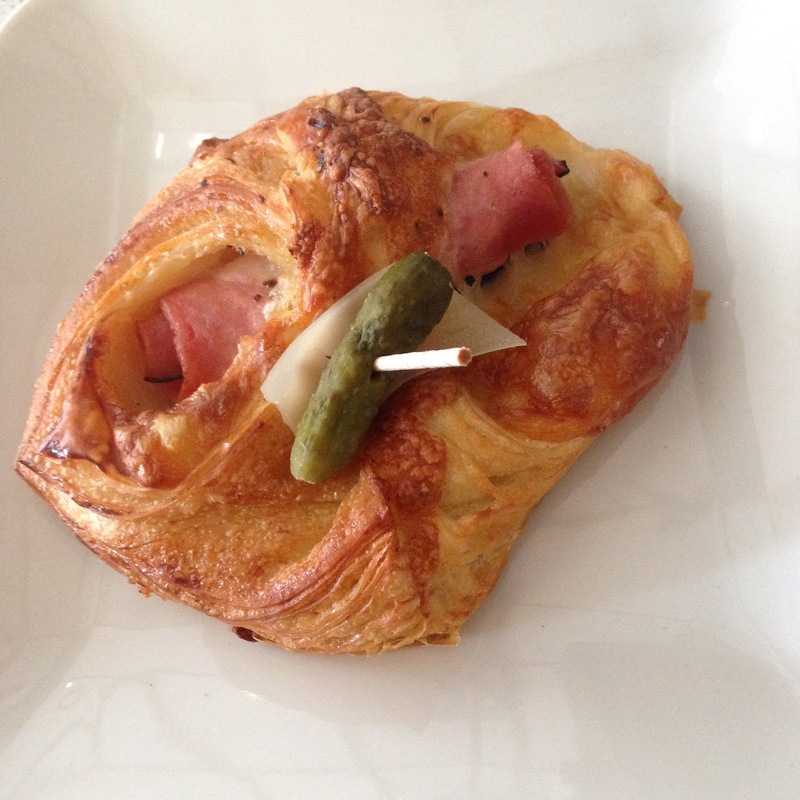 Their version of croque monsieur used high quality ingredients, but has since been replaced by some new items. 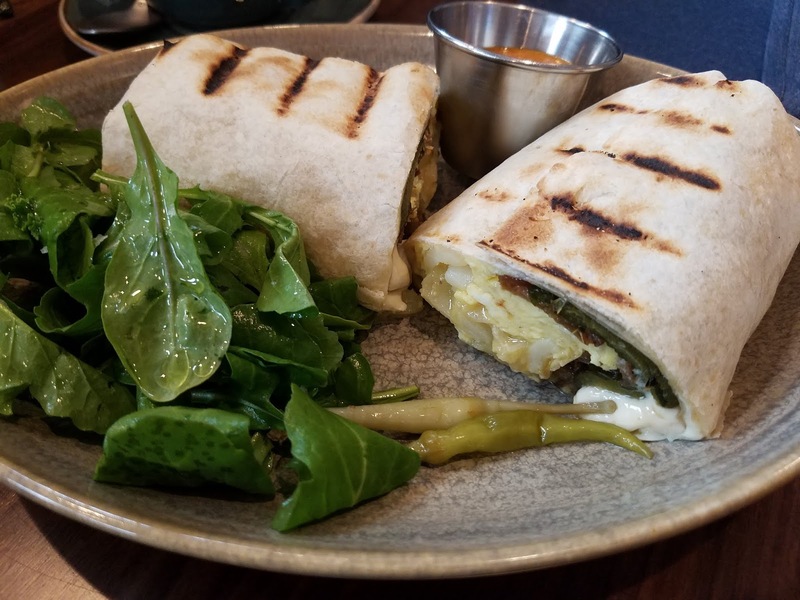 For those who want to standard Californian breakfast fare, they offer a breakfast burrito for only $8 that you can add bacon or chorizo to for a few dollars more. The beef bangers and mash for $16 is a sure fire winner for anyone who loves meat and potatoes in an elevated form. I don’t usually like mashed potatoes, but the kizame mashed potatoes made me a fan. 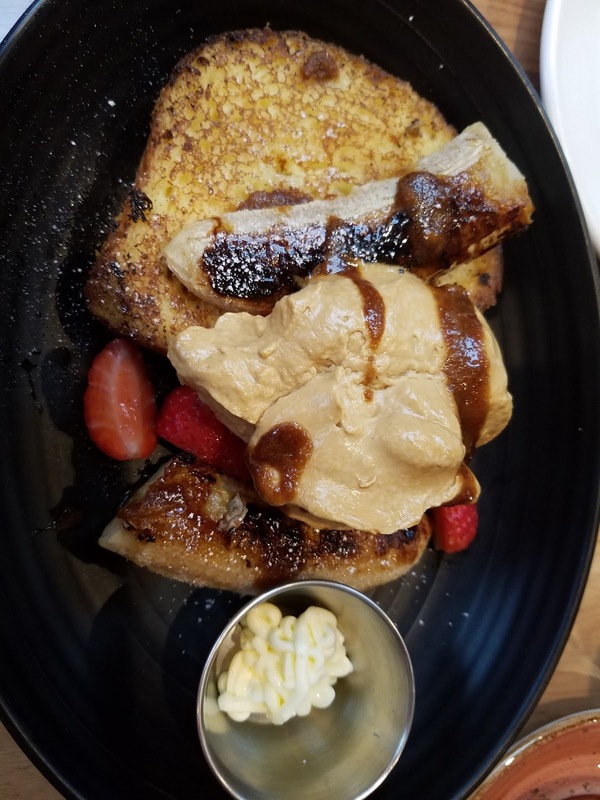 For a sweet brunch option, their French toast for $15 comes with an algarrobina cream sauce (carob based) and bruléed bananas. This was a bit too sweet for brunch for me, but it would have been a great dessert item. 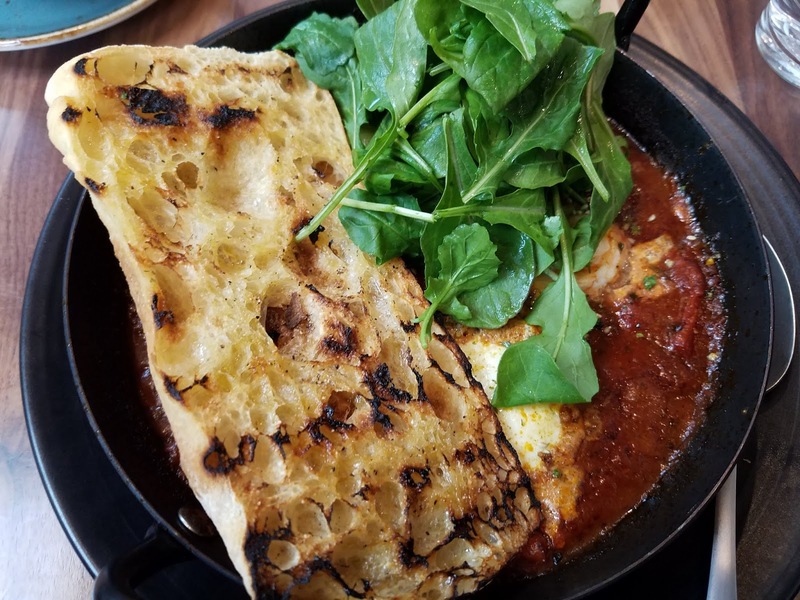 My favorite choice for brunch is their eggs shakshuka for $14 which comes with four prawns, two eggs, wonderful toasted ciabatta, and a spicy tomato bonito stew that had me using a spoon to scoop up every bite. I could eat this every day! 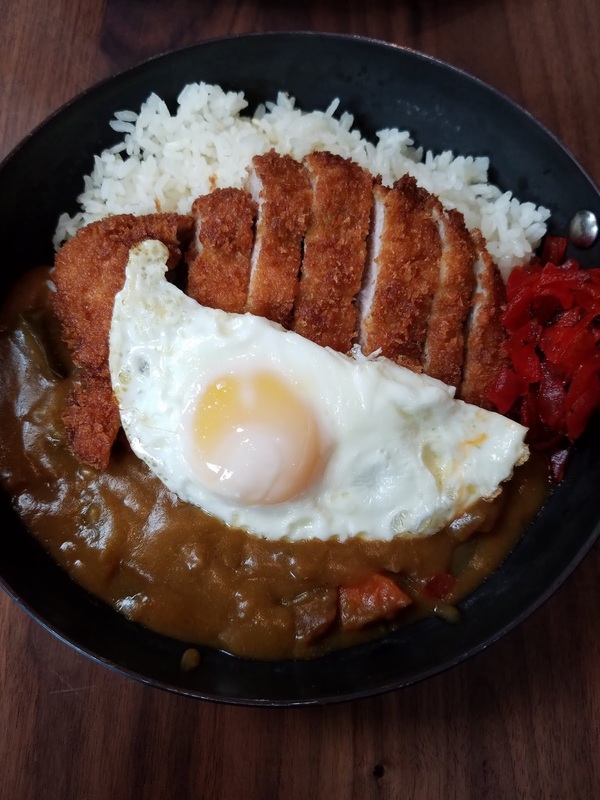 For those who want more lunch than breakfast, the pork tonkatsu curry for $18 is a solid choice, with enough to fill any hunger. I found the curry sauce a bit too sweet for my taste, but the depth of flavors was fantastic, and the quality of the ingredients was outstanding. I love this new addition to West LA with the light airy greenhouse decor. Thoughtful touches like foot rests at the booth and bar stools are a small indication of the attention to detail that go hand in hand with the quality ingredients and the deft execution of culinary skills from the kitchen. 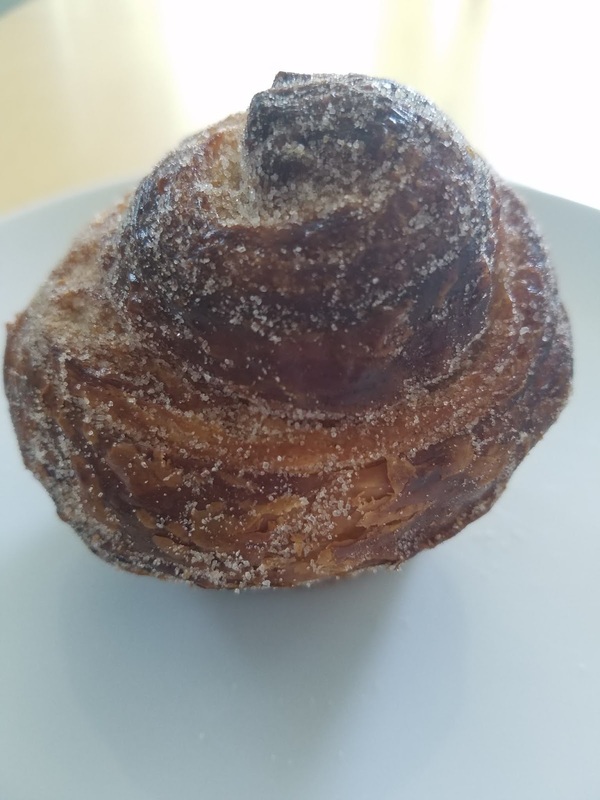 Two Guns has opened up several locations around the South Bay, and luckily for me the one closest to me has a full menu and delicious bites like this one that may be my favorite cinnamon roll, with flakey exterior and croissant like interior wound around layers of cinnamon. 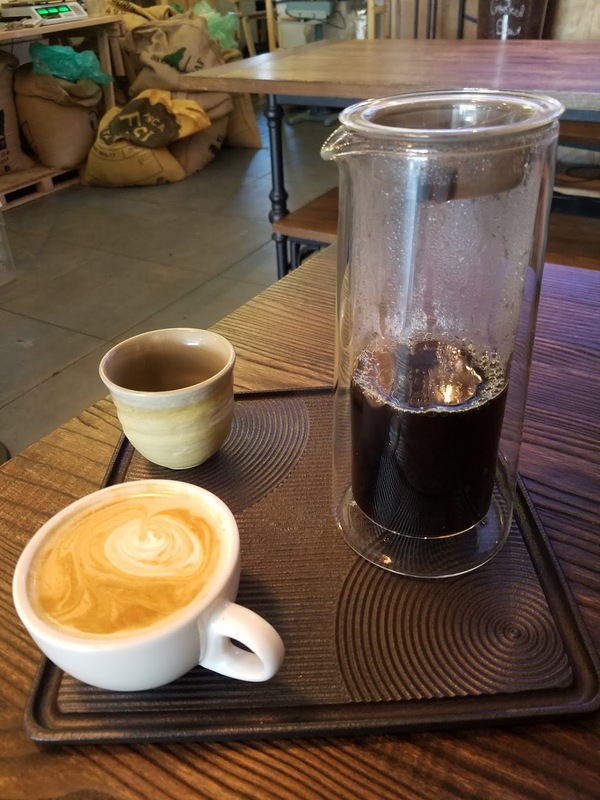 Coffee roasters usually serve better coffee than those who buy their beans already roasted; that is why I love The Conservatory in Culver City, and Jameson Brown, in Pasadena. 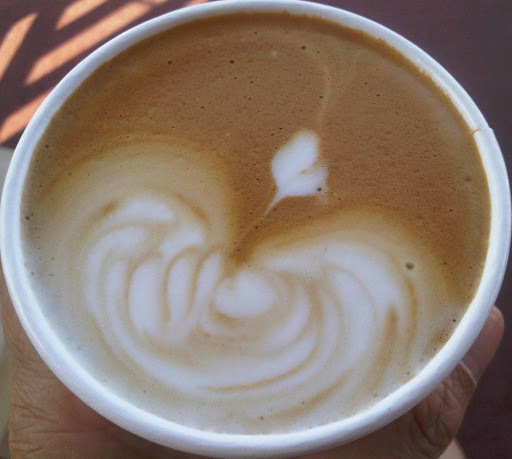 Demitasse is now my go to spot on Wilshire mid-city, or Little Tokyo. 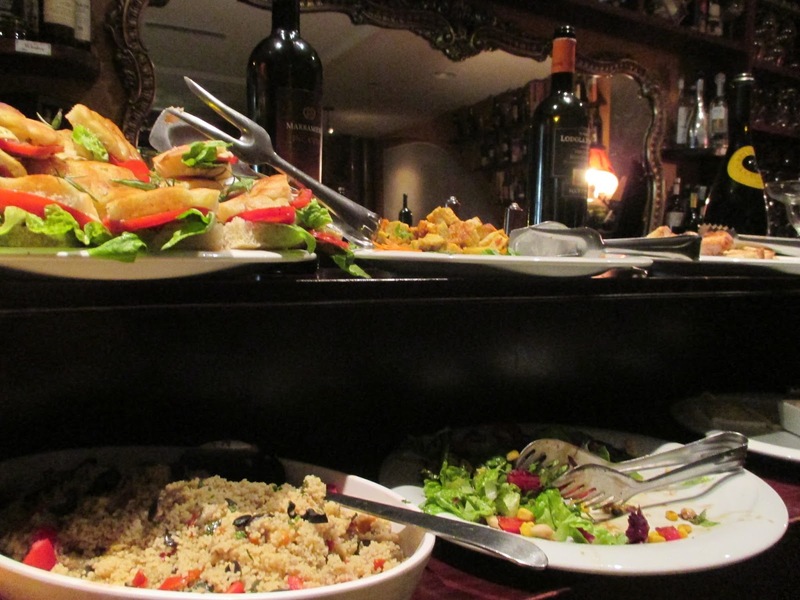 They stock some vegetarian friendly meals like rice stuffed grape leaves, quinoa salads, and flakey with butter pastries, so if you want a snack with your free wifi, you’ve got sweet and savory choices to either eat on the patio or take to go. 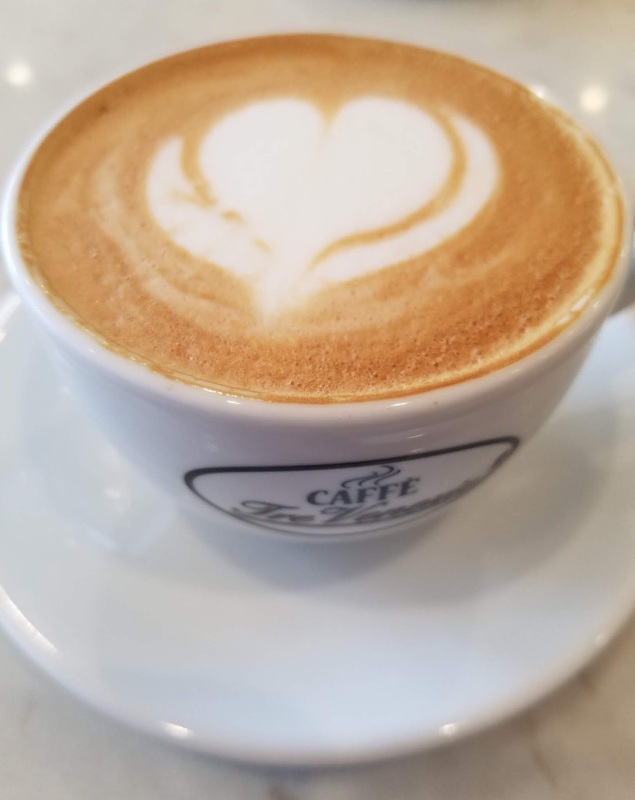 I enjoyed the ham and cheese bite I chose to go with my cappuccino; it was tasty and filling enough to tide me over until dinner several hours later. 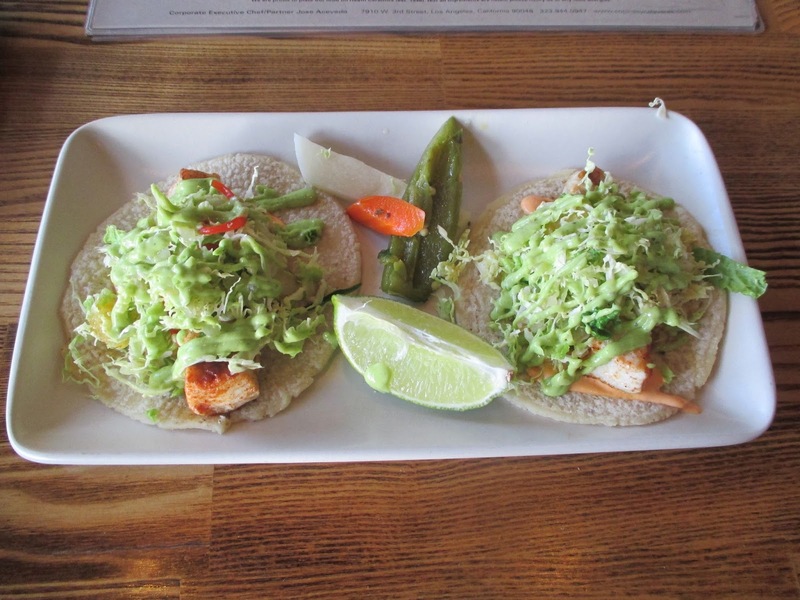 The menu at Mercado is based on the Mexican roots of chef José, so we started with the tacos pescado for $15, skillet seared white fish, Mexican slaw, avocado salsa, and chile de arbol aioli. Fresh clean flavors, but we found the homemade tortillas disappointing. 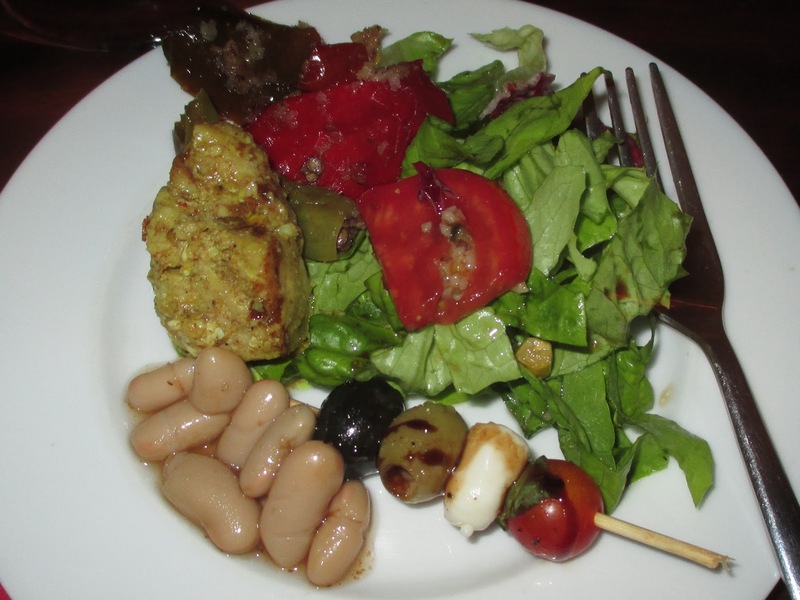 The pickled vegetables were a welcome surprise, adding zest to the plate. 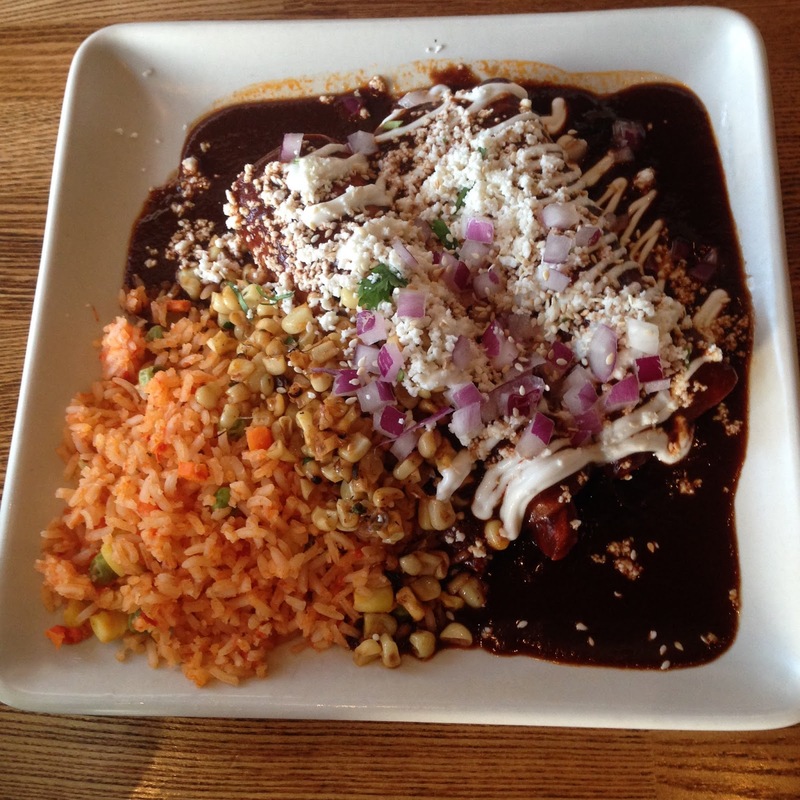 The enchiladas for $19 made with Mary’s free range chicken, Oaxacan mole, Mexican rice, queso fresco, crema fresca, red onions, and sesame seeds was beautifully presented, but we found it lacked enough character or depth of flavor to warrant ordering it again. 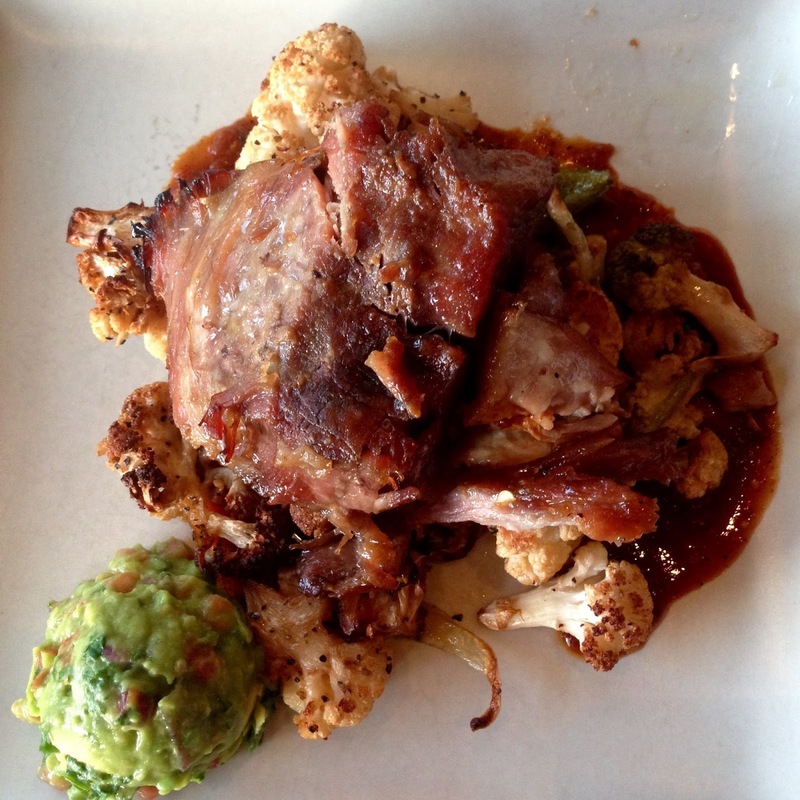 Our server said the carnitas for $25 are a crowd favorite and one bite of this tender Salmon Creek pork with guacamole, Yxta salsa brava and cauliflower with escabeche made me want another, and another, and another…This is a HUGE serving that could easily have served two, or you could take half of it home for another meal. With a wide selection of drinks and tequila, and a happy hour M-F from 5-7pm, I’m planning to return to try more. 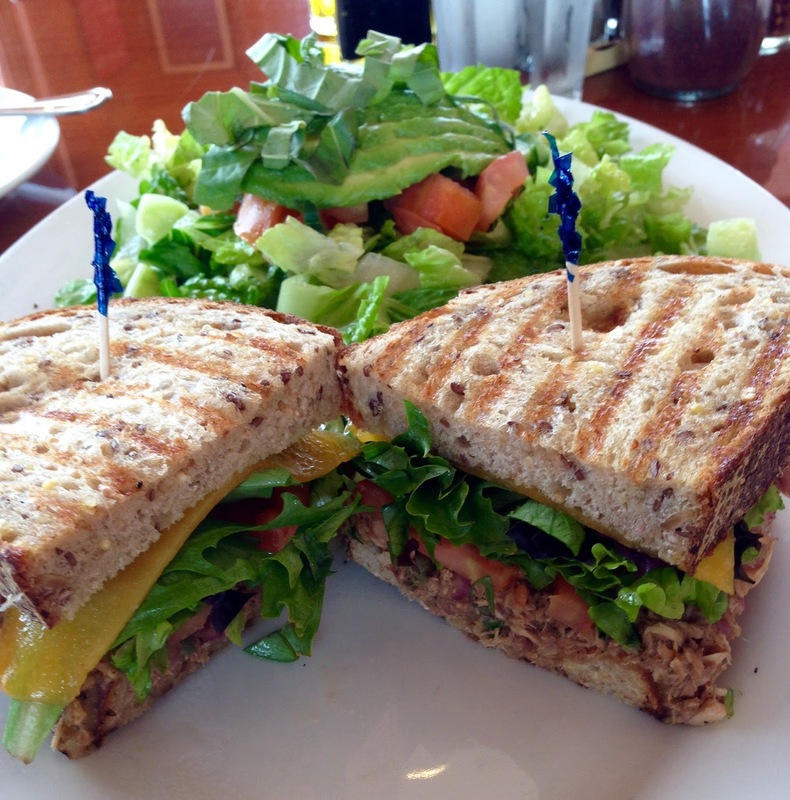 One of my lunches was in Orange County at Panini Cafe, a small chain that has branches throughout Southern California, serving Mediterranean inspired plates, with a few Southern California standards like the tuna melt I ordered. I liked the lack of mayonnaise in the tuna salad, but as you can see from the picture, the cheese was not melted. 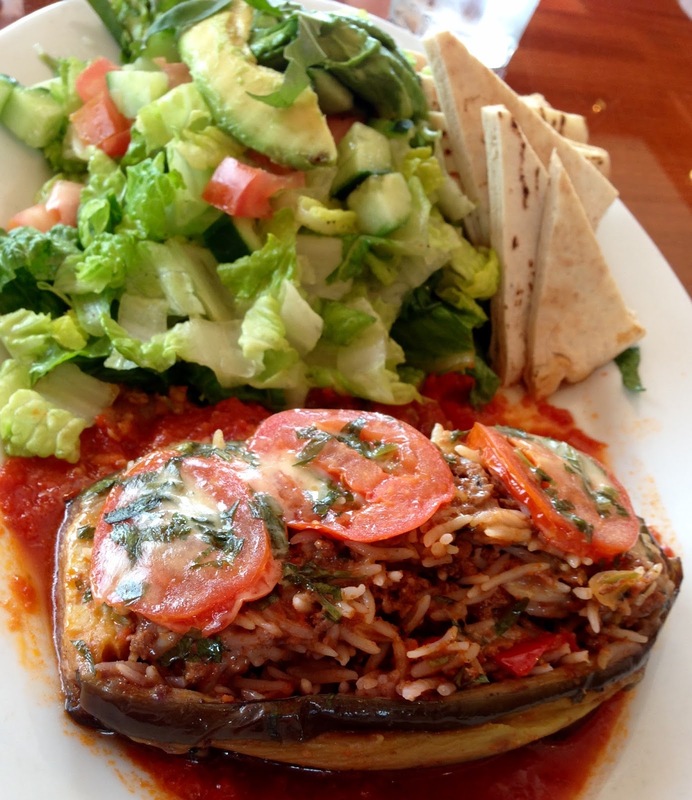 My friend and I split the sandwich and this eggplant stuffed with rice and ground beef. It was a very generous portion and redolent with earthy spices that gave it comfort food appeal. In true Californian style, we took half our meal with us in doggie bags, so the mid teen $ prices are a bargain for the fresh flavors and portions. Another day another lunch, or in this case, brunch in South Pasadena at Mike & Anne’s. 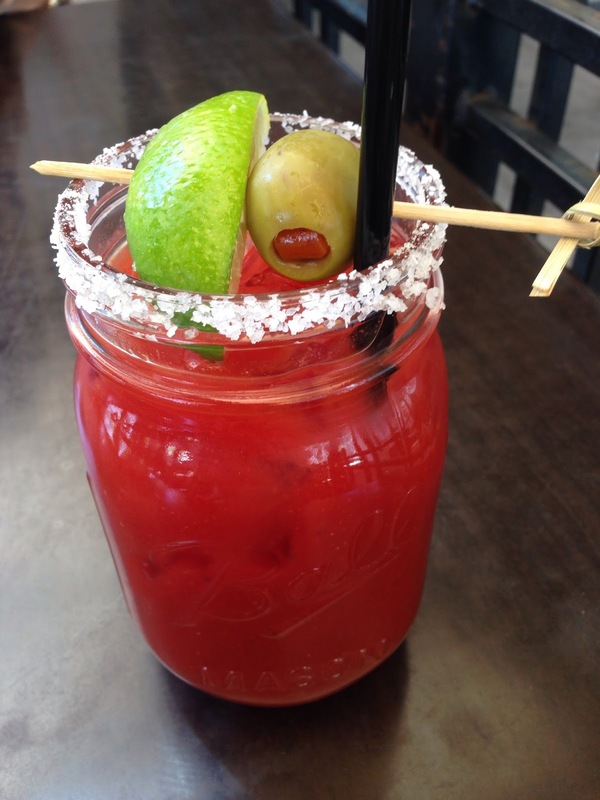 We started with a Bloody Mary, that was as potent as the $15 price tag. 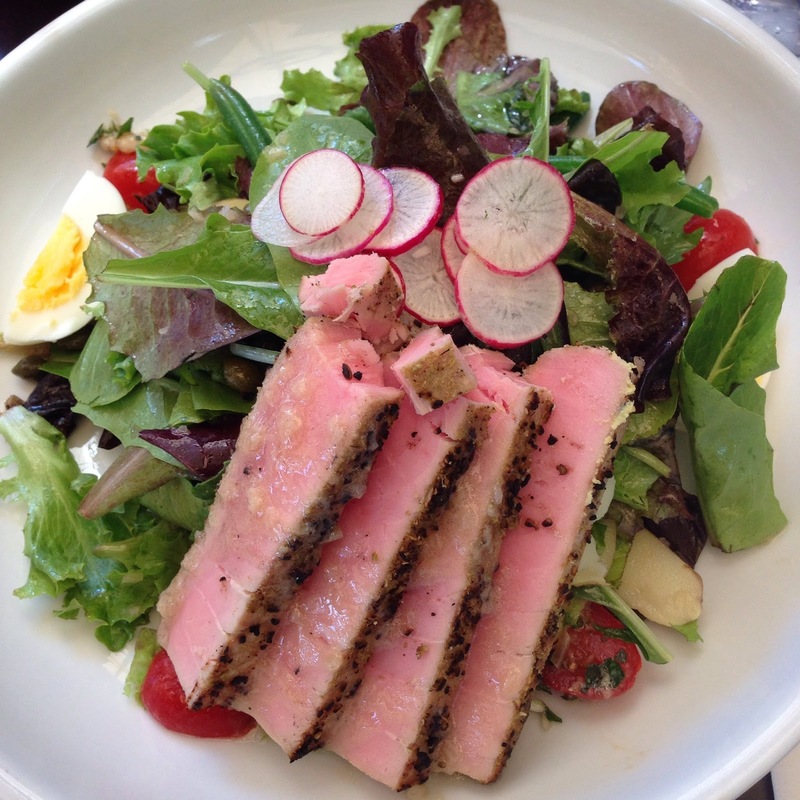 For this meal, we both chose the salad Niçoise with seared rare ahi. The ingredients were farm fresh, but we had to asked for extra dressing to make the salad pop. 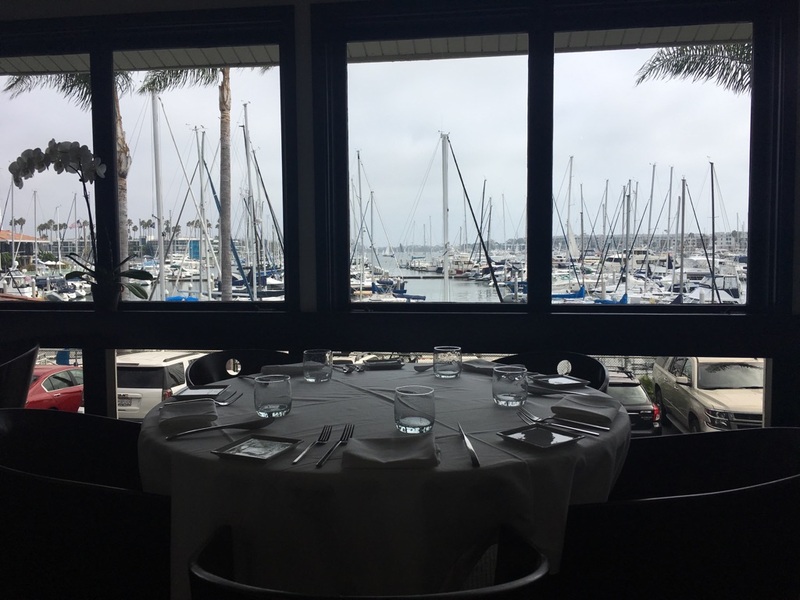 For the third lunch with yet another friend, we went to Cafe del Rey in Marina Del Rey. We arrived around 2pm when most people had finished lunch and got an unobstructed view of the marina from our booth. Unfortunately we waited for 30 minutes before anyone came by our table. I went to the host stand to ask for a server and they realized at that point that no one had been assigned to serve our table. When our waitress arrived she apologized profusely even though it was not her fault. 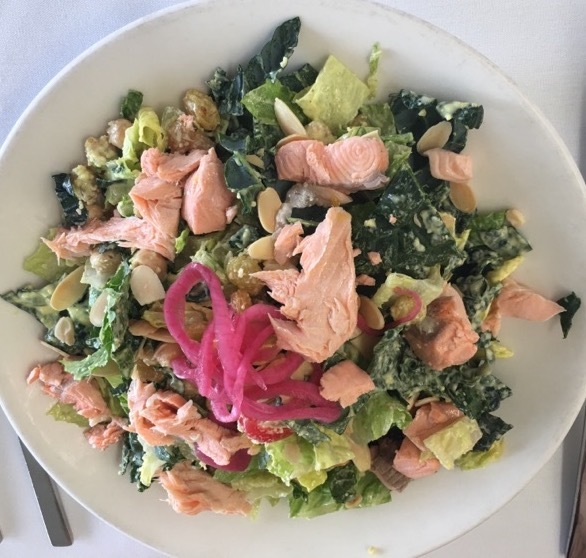 My friend chose the poached salmon kale salad and loved the mix of golden raisins, almonds, and chickpeas for $22. 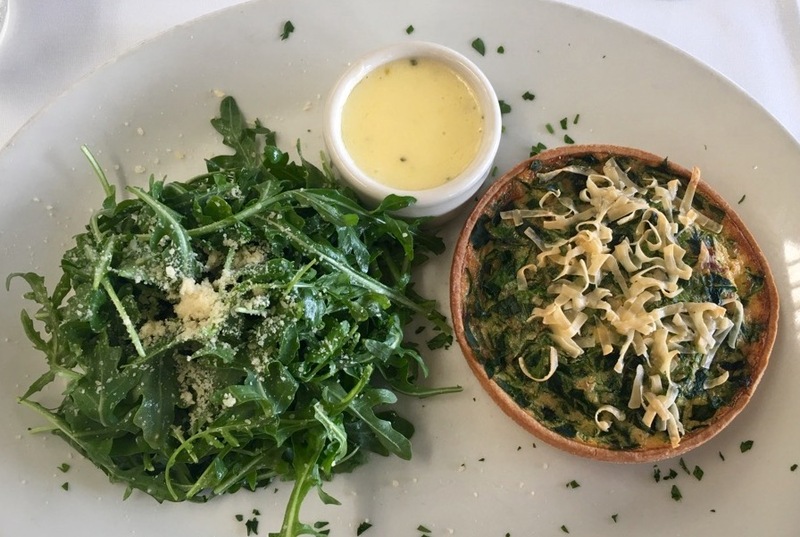 I chose the quiche, made with applewood smoked bacon, spinach, and Gruyère, served with a side of arugula for $15. The quiche was very good, but I found the thick crust a bit underdone in the middle. 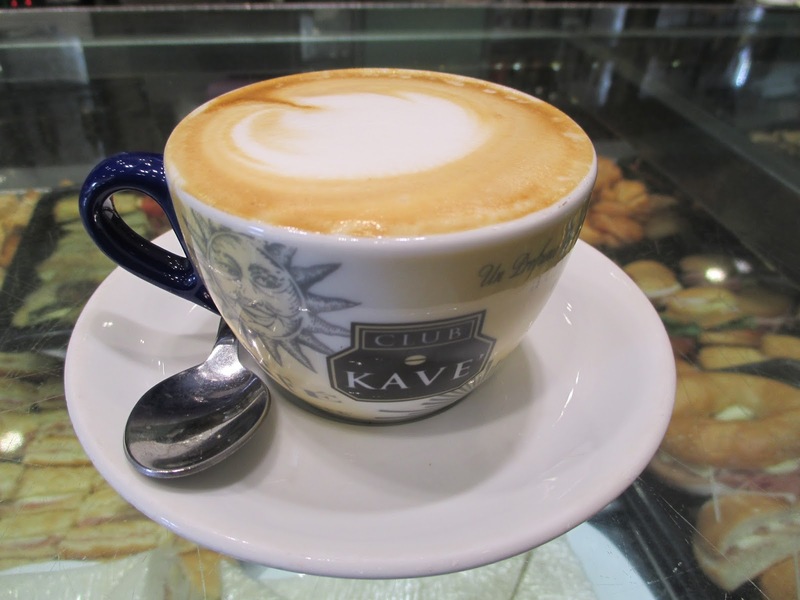 A cappuccino is the best way to start a day in Rome, especially since nearly every bakery, bar, and caffe makes an excellent cup. The bakery near where I was staying, Desideri Caffe, opens at the crack of dawn and serves locals heading off to work (I got my last cappuccino in Rome before my flight at 6am). The price of coffee is controlled at a certain amount if you drink it at the counter, and it was only 1.10 Euros. Yes, this wonderful cappuccino was only $1.20 US! Being a bakery, they had plenty of sweet temptations, but the best reason for me to go back was after one visit, the man behind the counter knew me and asked if I wanted my “usual”:) The residential parts of Rome, like Monte Verde, are big extended families, and once you arrive, you are welcomed, usually with a smile. 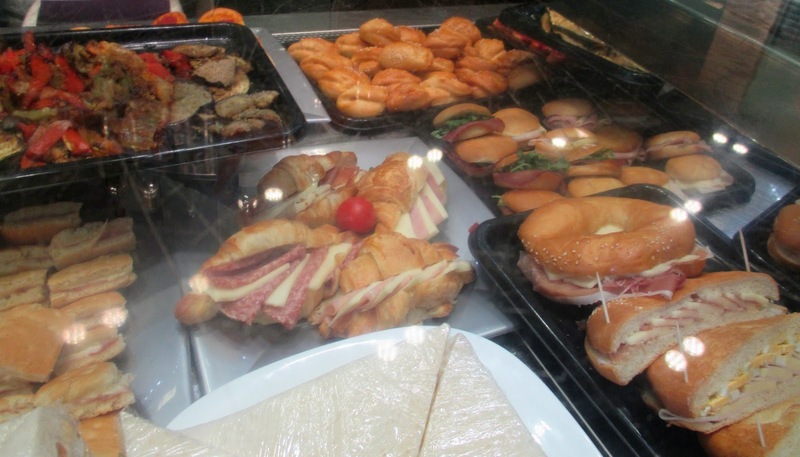 As lunch time approaches, the sweets in the case become sandwiches, to go or to eat at the tables inside or on the patio of the bakery, which also has a full bar if you want a shot of alcohol in your coffee. Their sandwiches for around 5 Euros or $6 US, looked amazing, but I had other plans for lunch. 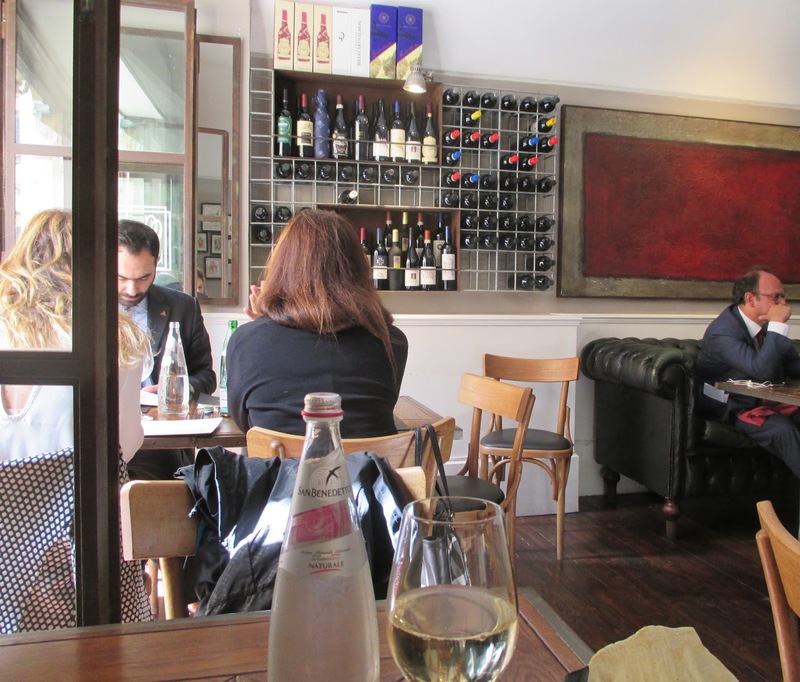 Enoteca Spiriti is a wine bar opposite the Temple of Hadrian, not far from the Pantheon. It was the least touristy place I found in the area, so I took a chance and had lunch there. Every one of the men wore a blue suit with a red tie, and all the women carried expensive handbags. They all seemed to know each other, greeting each arrival with kisses and or handshakes. I wondered if I had walked into a secret club, but then I learned Temple of Hadrian now houses a bank. Ah no wonder so many people were drinking water in a wine bar! 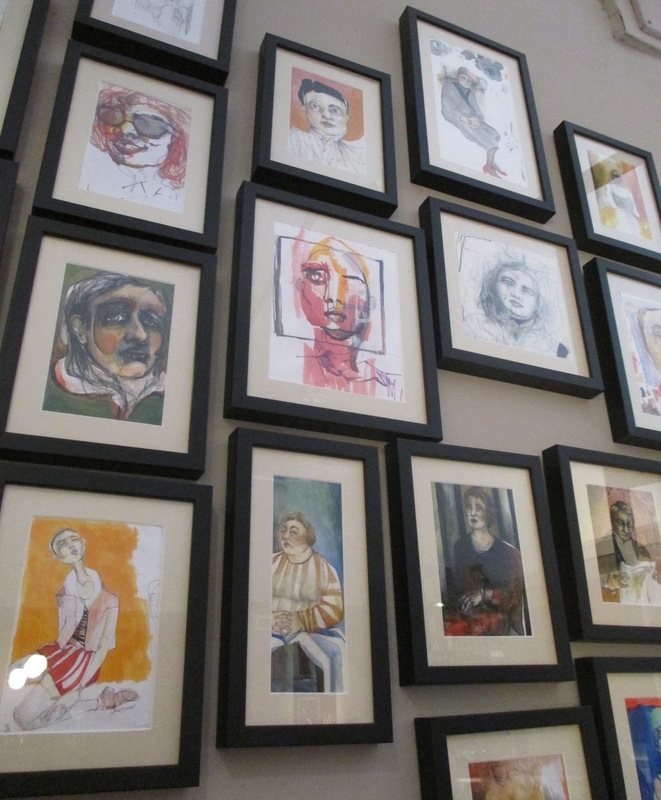 The decor and artwork were very original and low key. which seemed to be the theme of the place, extending to the breadbasket. 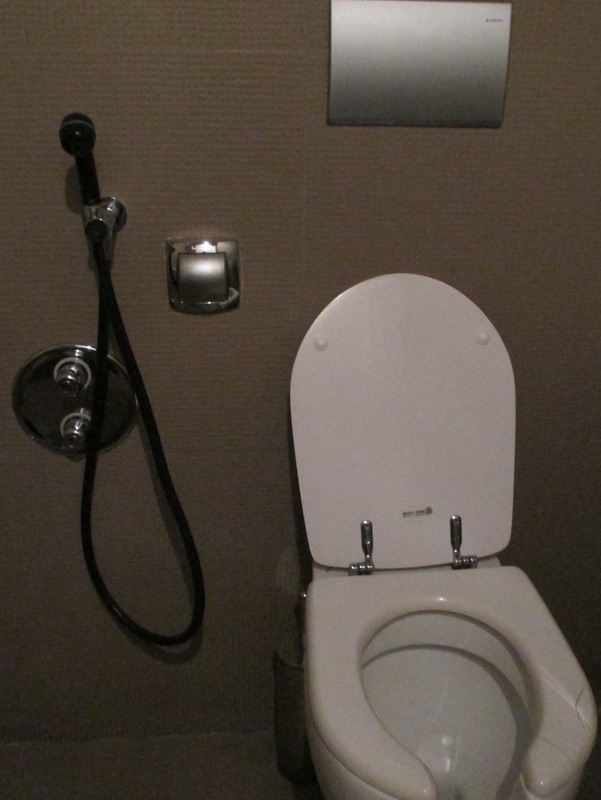 Even their toilet had an attachment if you wanted to rinse yourself after your meal, which I nearly wanted to do when I went to pay my bill and the waitress tried to add an additional service fee of 3 Euros, but since I had gotten the bill at my table, she couldn’t ask me for more since I had the itemized total tally in writing in my hand. Bankers aren’t the only ones trying to add fees! 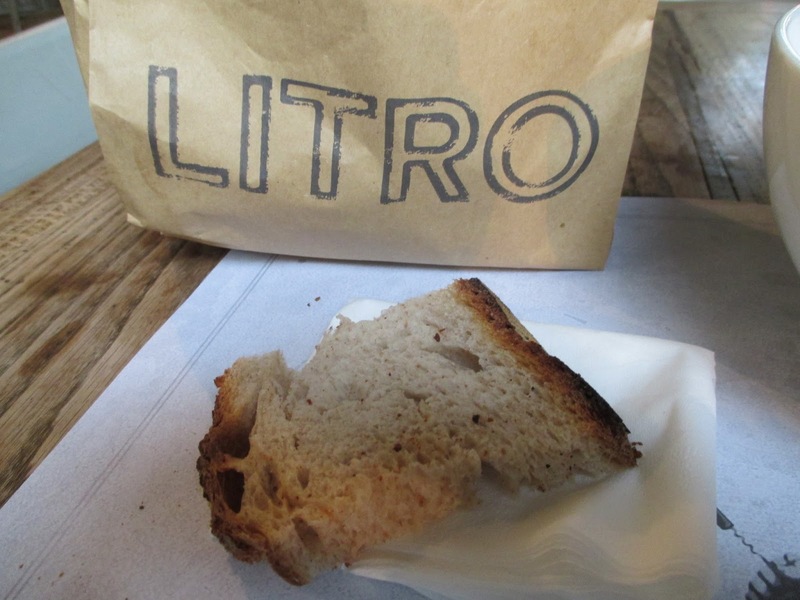 I had a much better experience, and much better food at Litro, which was very conveniently located directly in front of a bus stop on a line I took into the touristy parts of town 🙂 The wonderful thing about Litro is that they are open all day, serve everything from snacks to full meals, and they have a good selection of wines and desserts. It’s a casual place with a small patio. It’s so warm and friendly, one day one of the owners was there playing with his son and feeding him as he was serving the customers. 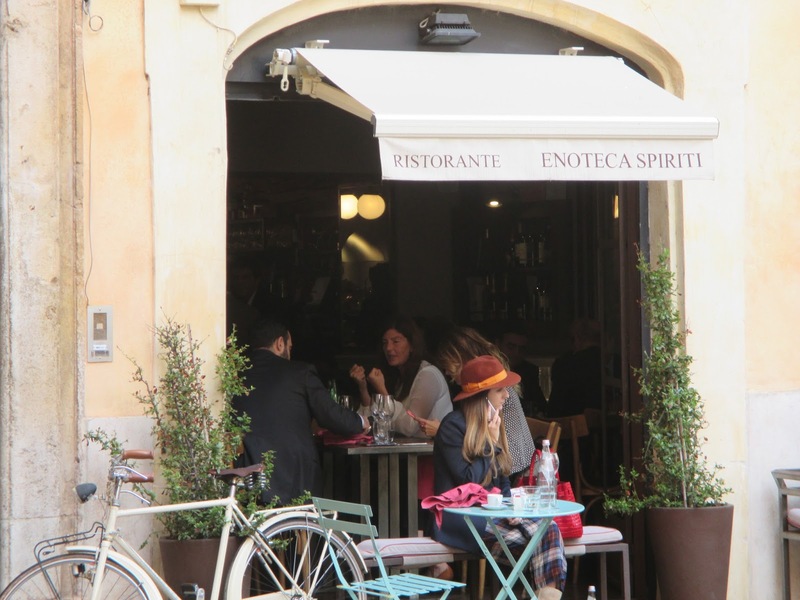 There are daily specials on the chalkboard outside, and one day it was a bruschetta with guanciale for 5 Euros or $6. 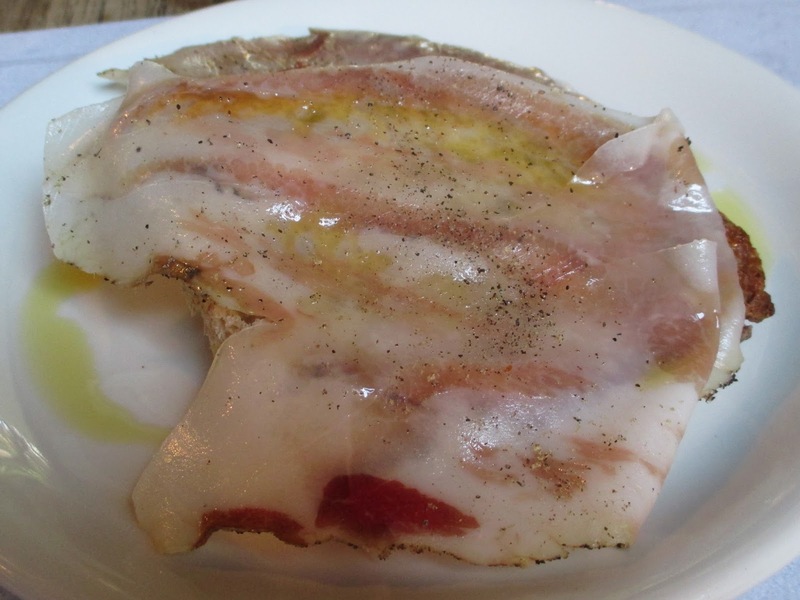 This was a perfectly grilled toast topped with pork “jowl bacon” dressed with excellent olive oil, the tender thin slices of smoked cured meat nearly melted onto the hot bread, and was so redolent with thyme and pepper, that my mouth had a little dance party! 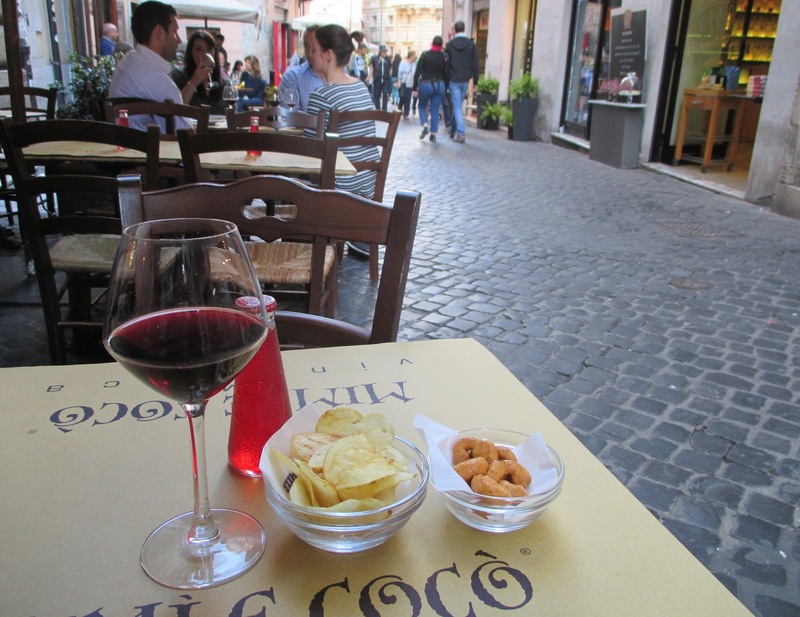 I had a nice glass of Mescita for 4 Euros or $5 with the bruschetta and that kept my hunger at bay until restaurants opened for dinner three hours later. 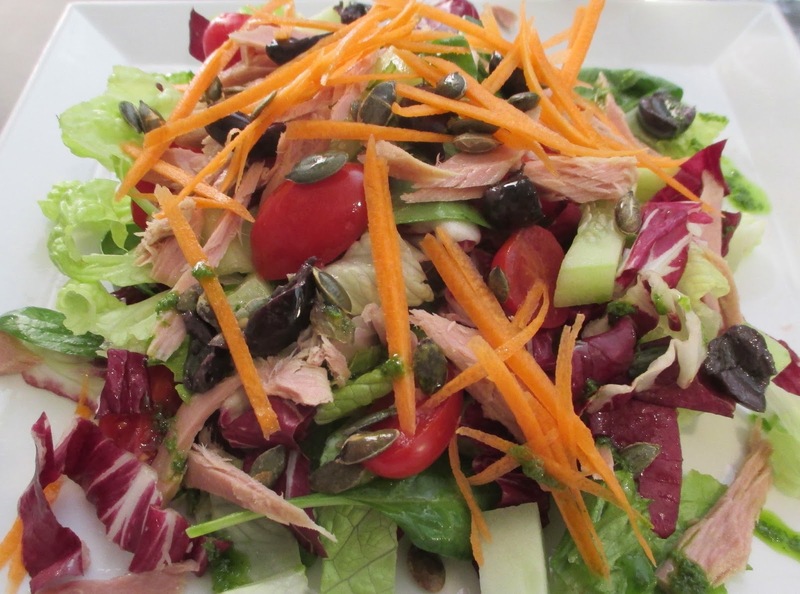 On another day between Roman lunch and dinner restaurant hours, I was so hungry, I needed a meal, so I ordered their tuna salad for 12 Euros or $13. This salad was easily the biggest one I’ve seen since leaving Los Angeles! The bottom of the bowl was filled with even more goodies, from tomatoes to cucumbers and olives, besides the eggs and uniquely fabulous Italian tuna in olive oil with bits of crunchy croutons. 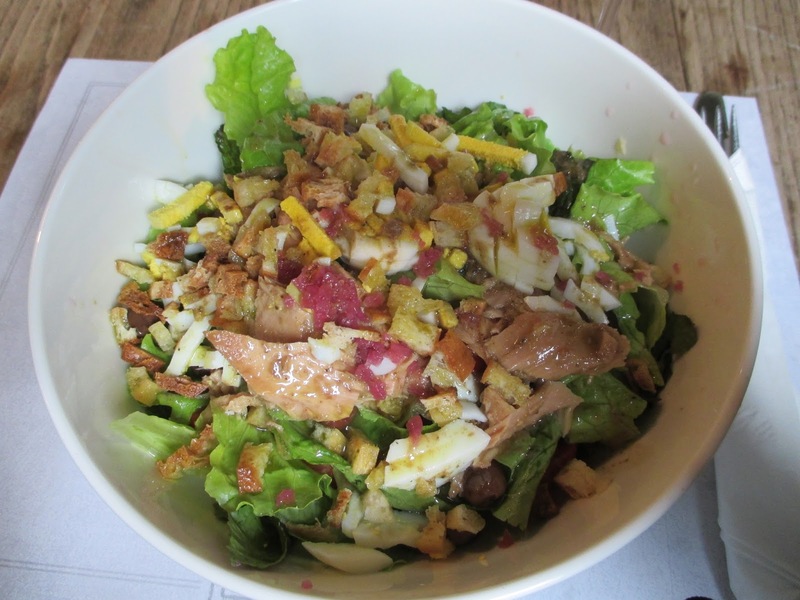 This salad was so delicious that I actually wanted to go eat it again but I was so full from my other meals, that I never got a chance to go back for another. This picture really doesn’t do the salad justice, but I was too hungry to even toss the salad before digging in, and once I did, I couldn’t stop eating until I had finished the entire bowl! 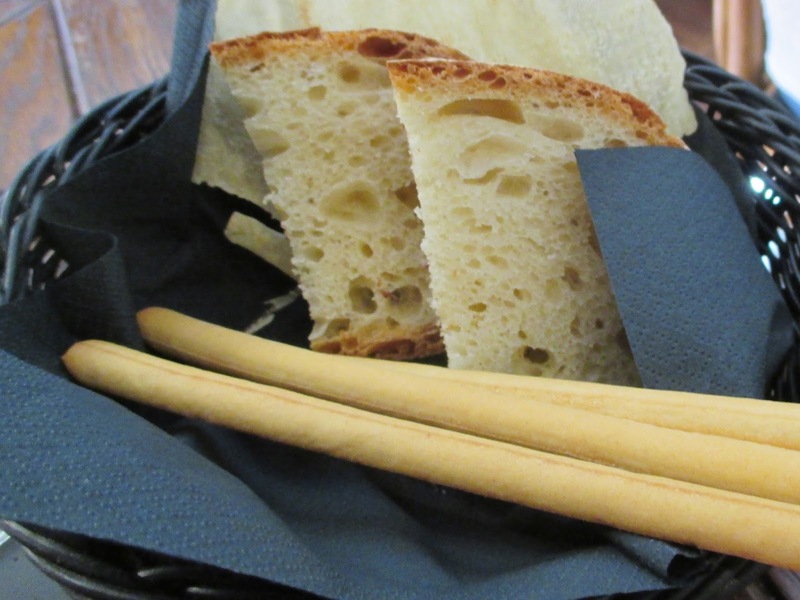 They had fabulous bread which arrived in a bag! I should have taken the bag with me, which is why I think they served it in a bag, especially since it was 2 Euros or $2.30 US for the bread. 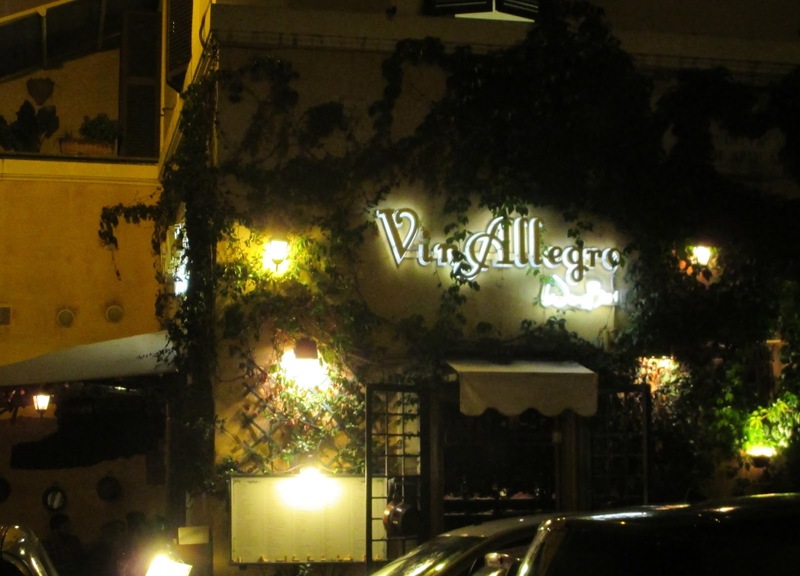 The Trastevere neighborhood has become touristy, but it’s still got some charming corners tucked away on the little streets leading into the central piazza, like this one with Vin Allegro. 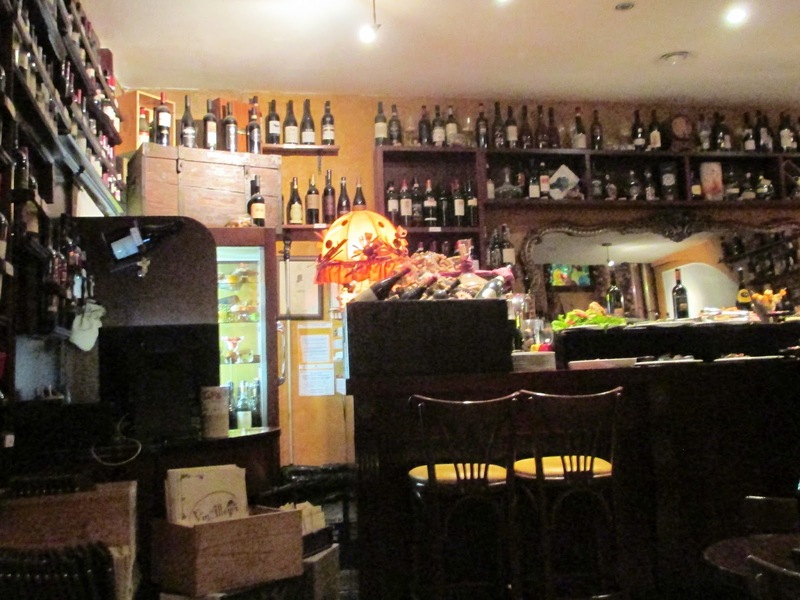 They are a very well stocked wine bar with a virtual store room in plain view. They have a generous happy hour where for the price of a drink, you get to choose as much as you wish, as many times as you wish from the two tiered buffet. 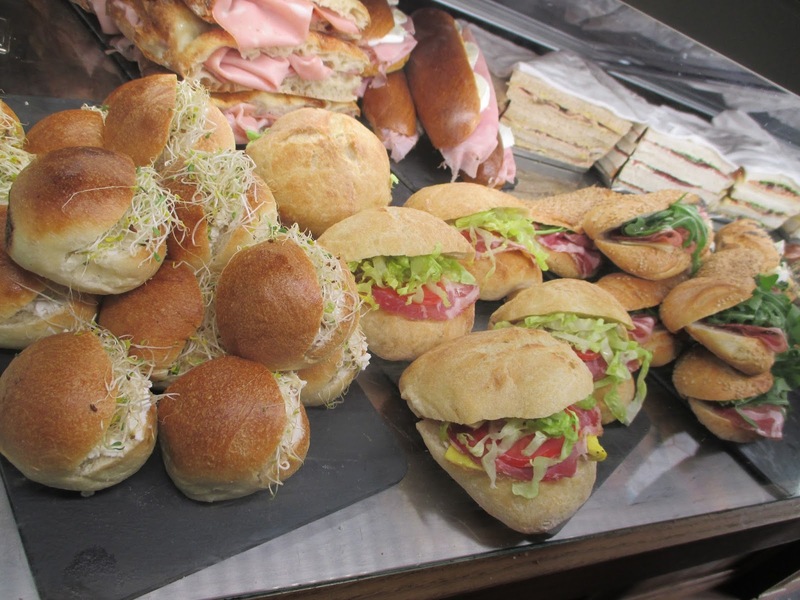 The buffet has everything from sandwiches to salads, vegetables, to meat, and everything in between. I sampled a bit and enjoyed everything on my plate. 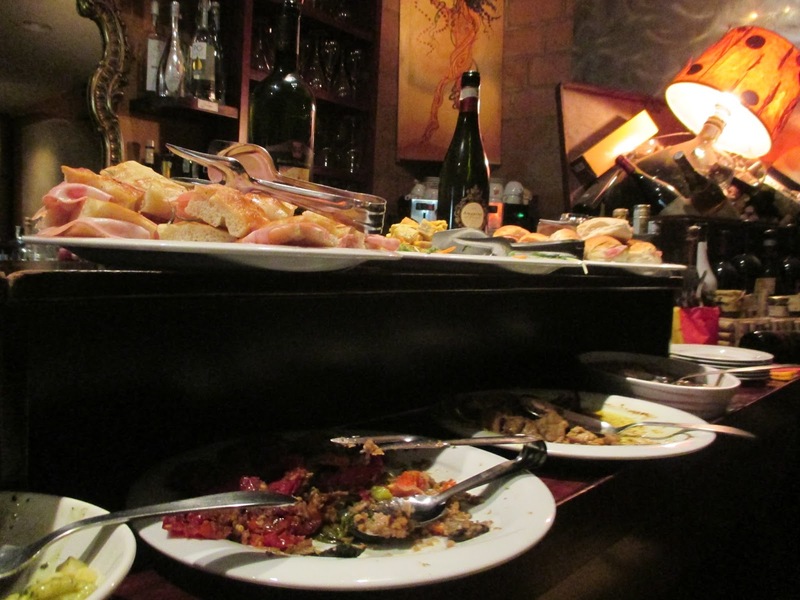 You could easily make a light meal from the buffet happy hour if you didn’t want a full dinner. They also have a menu if you prefer something hot to go with your wine. Most glasses are about 5 Euros or $6, so when you consider you can eat as much as you want with a drink for this price, it’s an amazing value. 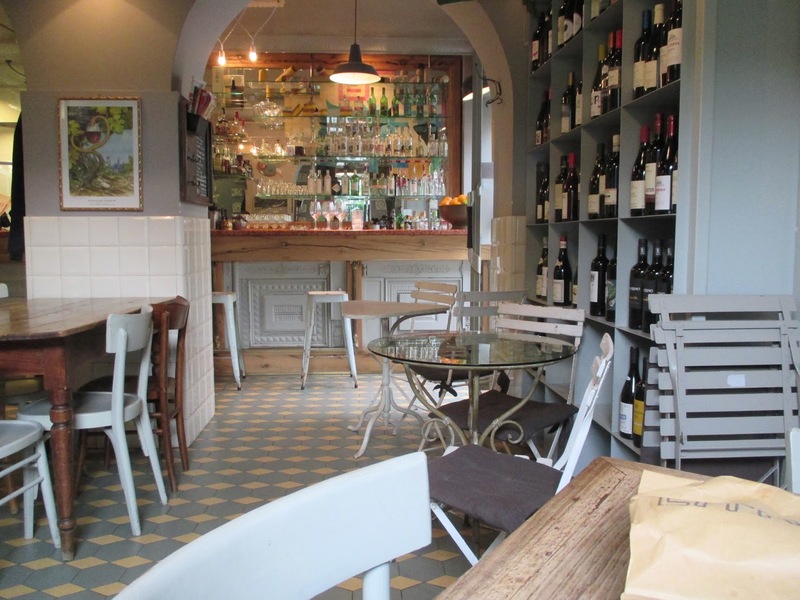 Add the charming ambience and indoor /outdoor seating, and you have a very good address to go to before or after dinner. Unless I’m getting on a plane, I don’t get up early, but a friend was visiting who doesn’t speak French, so to make sure she got on HER plane, I got up at 6 am! 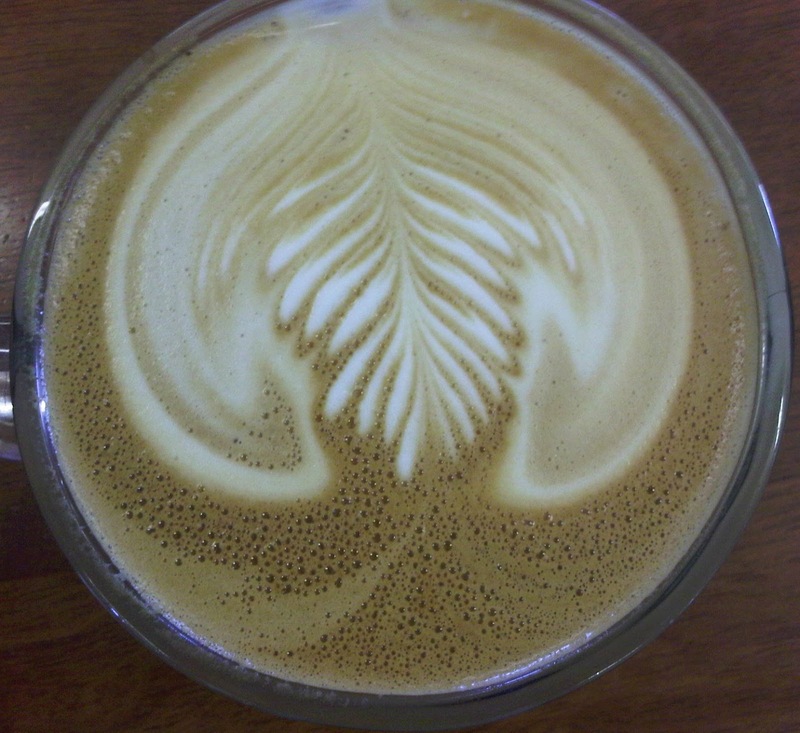 I was definitely in need of great coffee after seeing her off, so I headed over to Ten Belles. This perfect cappuccino almost made me forget that it was barely daylight. 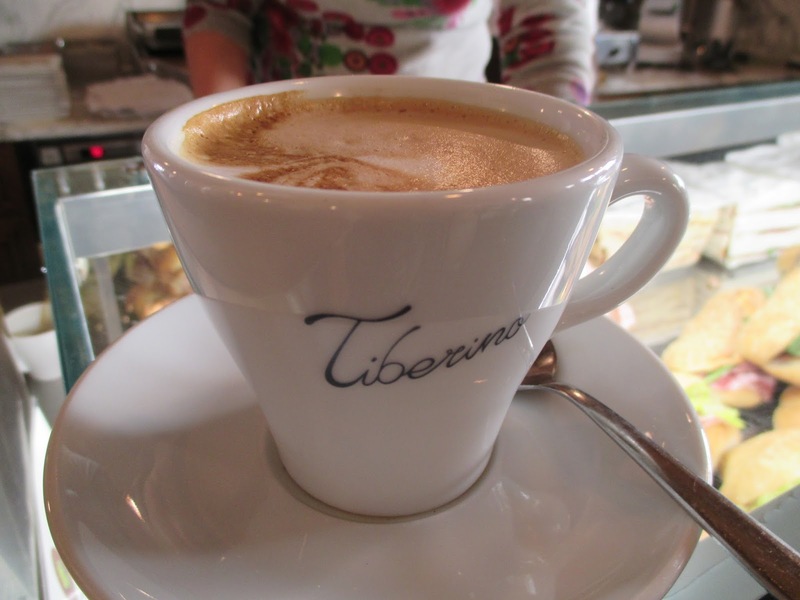 It was the best cappuccino I’ve had in Paris (so far)! 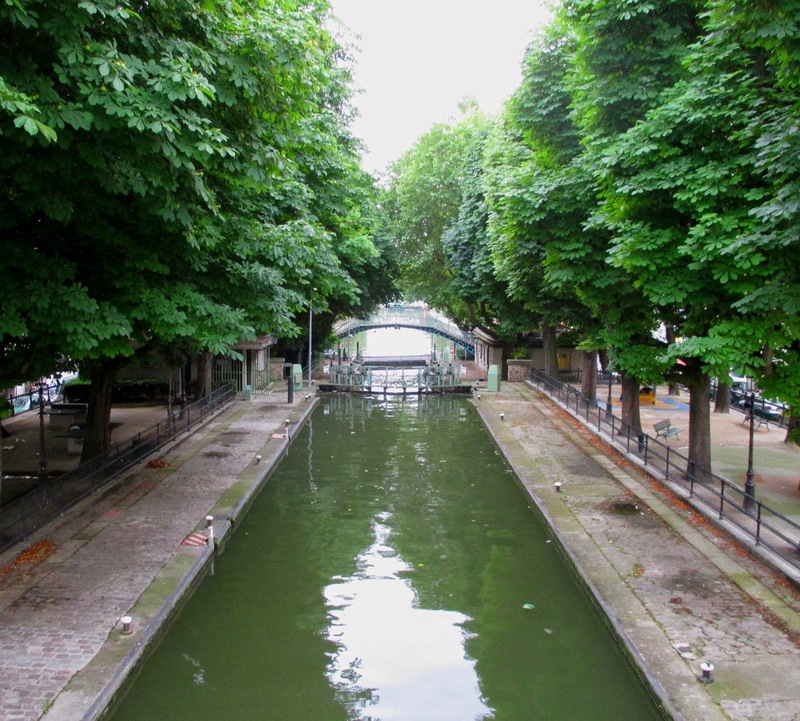 Canal St. Martin can be a desolate place in the winter, but with the lush greenery of summer, even rain clouds couldn’t detract from the beauty of this area. 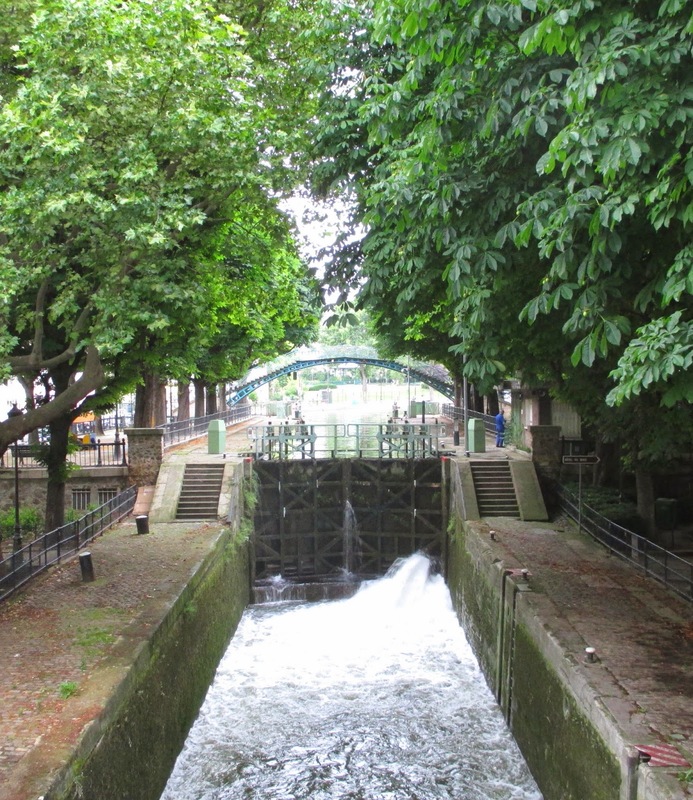 Yes this is a working canal with water locks that open and close. 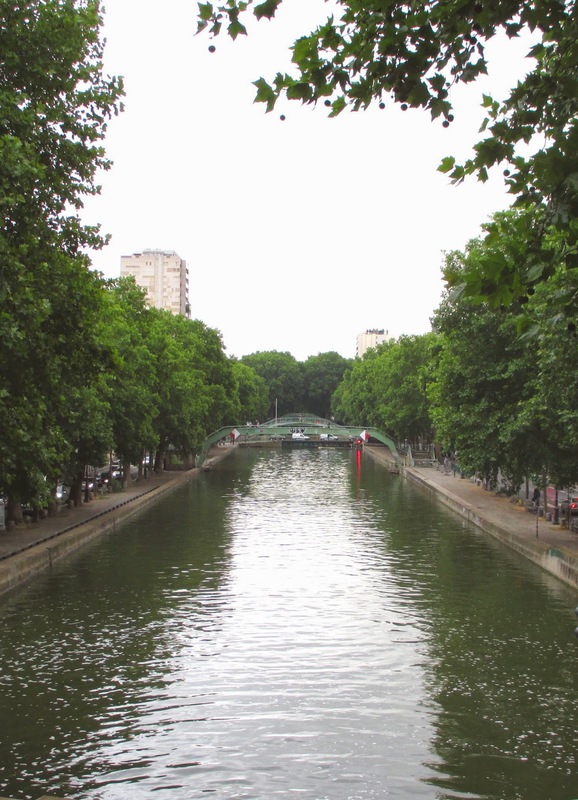 Some areas are off limits due to the water locks, but there is plenty of walkable waterfront to stroll. 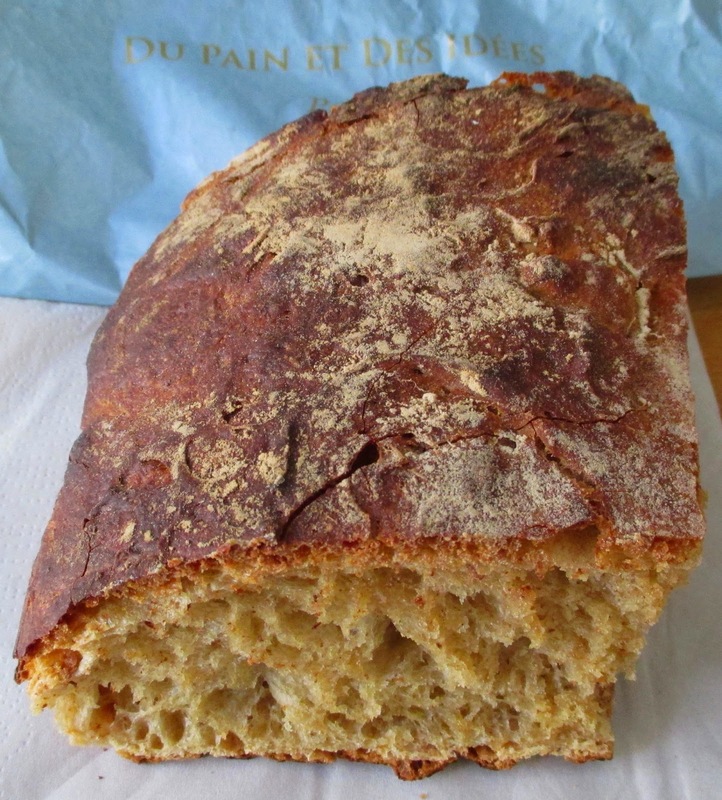 Besides coffee, I was in this area to pick up some Pain des Amis (bread of friends) from Du Pain et Des Idées; this is now my favorite bread and my only regret is that I only bought a quarter loaf instead of a half loaf! 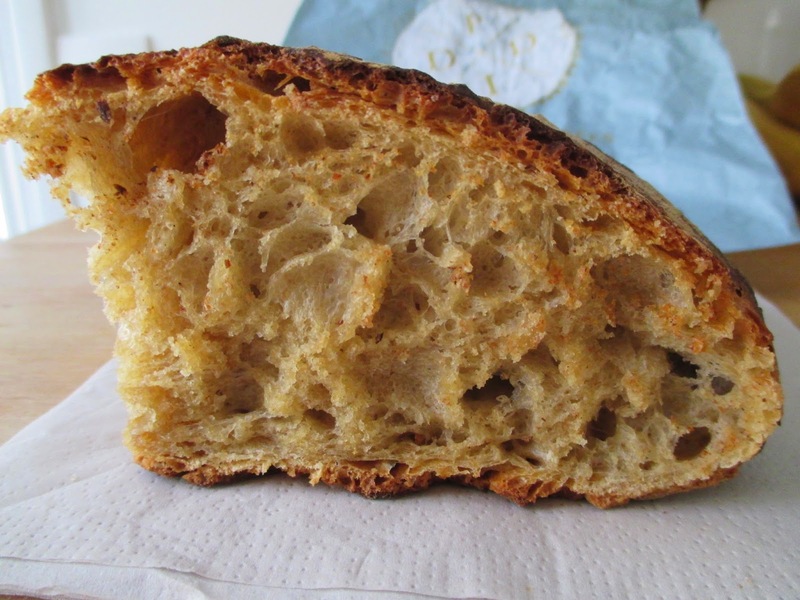 Baked in a wood fired oven, the smokiness in the crunchy crust and the long slow rise of the yeast makes the texture of the interior mellow, nutty, and slightly chewy. If you love good slow and low smoked BBQ with a smoke ring crust, this will be your paradigm for bread. There are very few places I will go for coffee. I’m highly sensitive to pesticides and since coffee is usually grown in countries with lax regulation, I only drink organic. 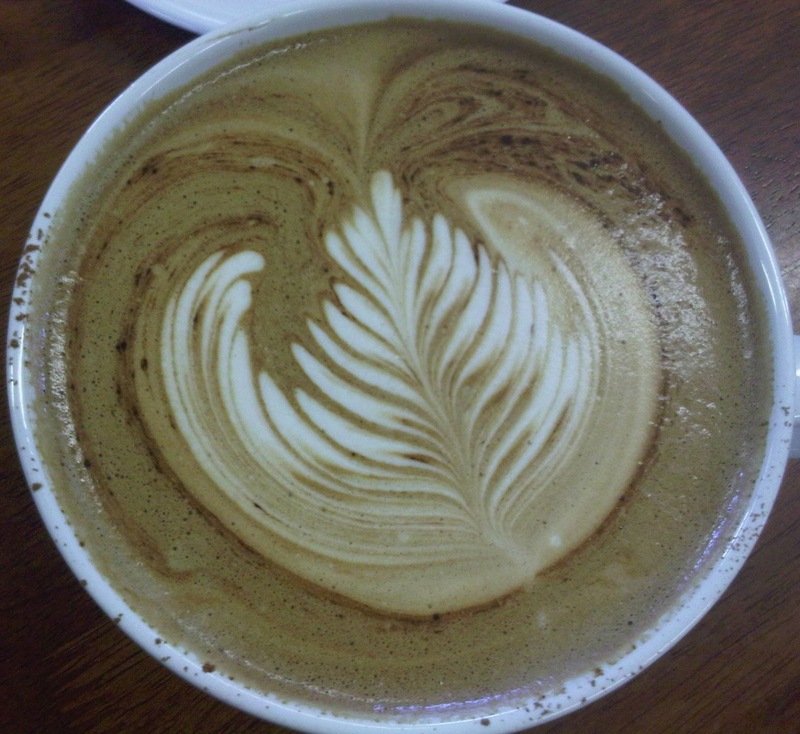 Unfortunately, you can’t always trust some cafés which say that they serve organic coffee on their menu. I found out recently that one place I had been frequenting had falsely advertised. 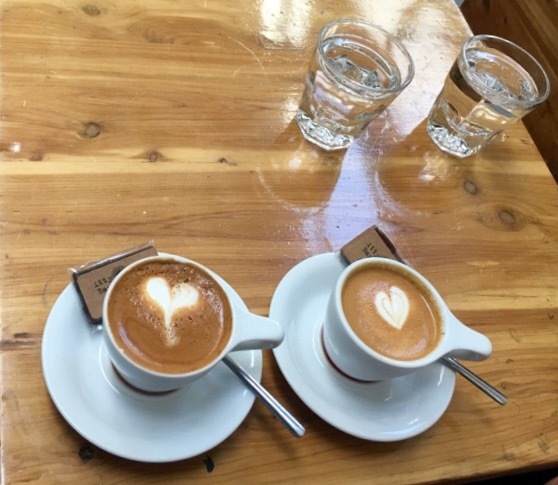 My headaches and upset stomach led me to ask the owner the source of his coffee, and because I knew the purveyor, I also knew the coffee and tea listed on the menu as organic were not. Like my friends at Lindy & Grundy, who know which restaurants actually serve grass fed pasture raised meat, I know which cafés actually serve organic coffee. 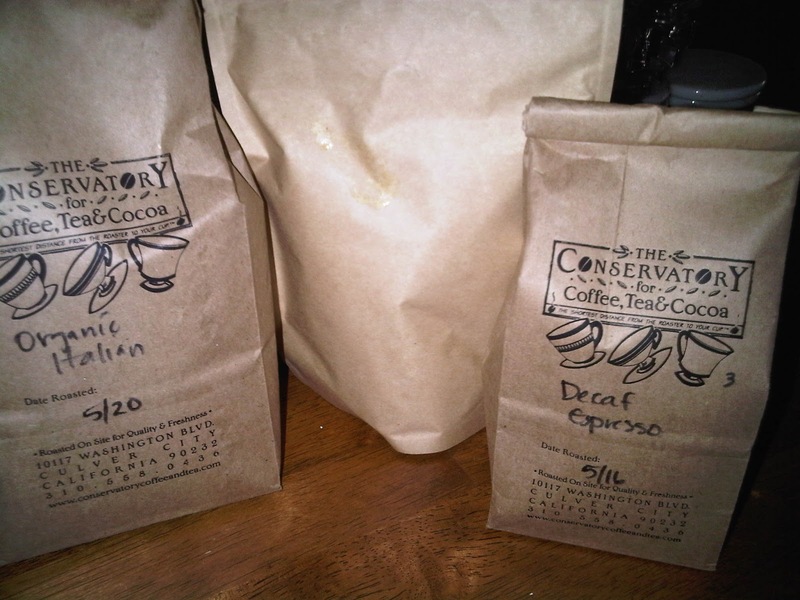 Conservatory in Culver City is a small family run business that not only serves organic coffee, but they also roast their own beans. Because I live close by, I get only enough to last for a few weeks at a time. They label the bags with the roasting date, so if you forget when you bought a bag, it’s marked. The middle bag is of Blood Orange Rooibos tea, which has a citrusy aroma and tangy taste that makes a non tea drinker like me happy to imbibe it. The tea is my nighttime beverage because sipping this noncaffeinated red tea it actually helps me get to sleep. I transfer my purchases into my own containers when I get home. Churros Calientes lives up to its name, the churros are freshly made with organic flour, and come out piping hot. The storefront is only about 300 square feet with a counter and two tables inside, and a few outside, so you instantly bond with the other patrons. The owner asked me to compare his churros to ones I had eaten in Spain and I would have to say these are BETTER. They are crisp, tender, and lightly dusted with organic sugar, adding a touch of sweetness that makes them excellent plain. Because they are also freshly made (and fried in a light oil), they are a bargain at $3.85! Where else can you get a made to order hot dessert for that price? I ordered the churros con chocolate for $6.75 which included a thick creamy drink made of organic cacao beans with the churros. When asked why I was not drinking the chocolate, I responded that I use it to dunk my churros, just like in Spain. If you are a serious chocolate fiend, perhaps you can drink the super rich hot chocolate, but after one sip, I used it as a “sauce” for my churros. 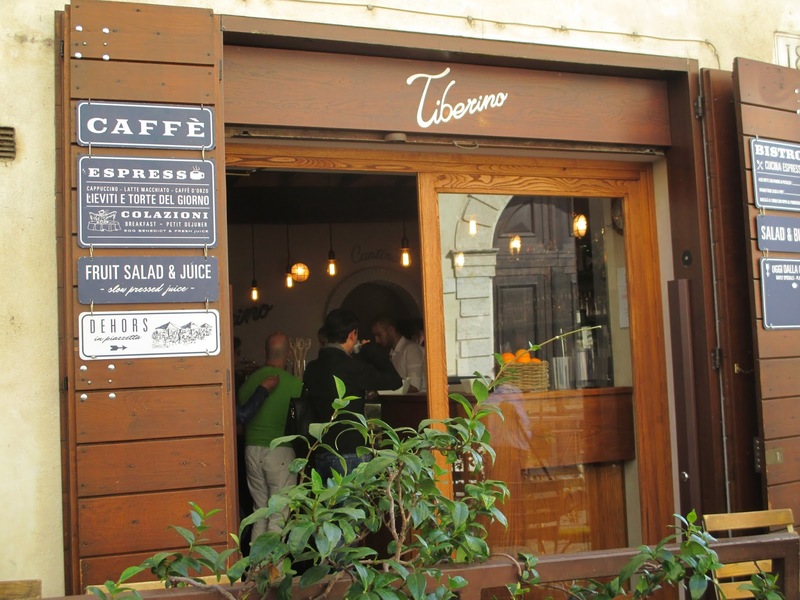 The small cafe also serves soups, salads, paninis, and a range of organic coffee and teas, so if you want something besides churros, you can get it here. Several people came in for orders to go, and since I couldn’t finish my order, the owner packed my leftover chocolate &amp; churros to go for me. 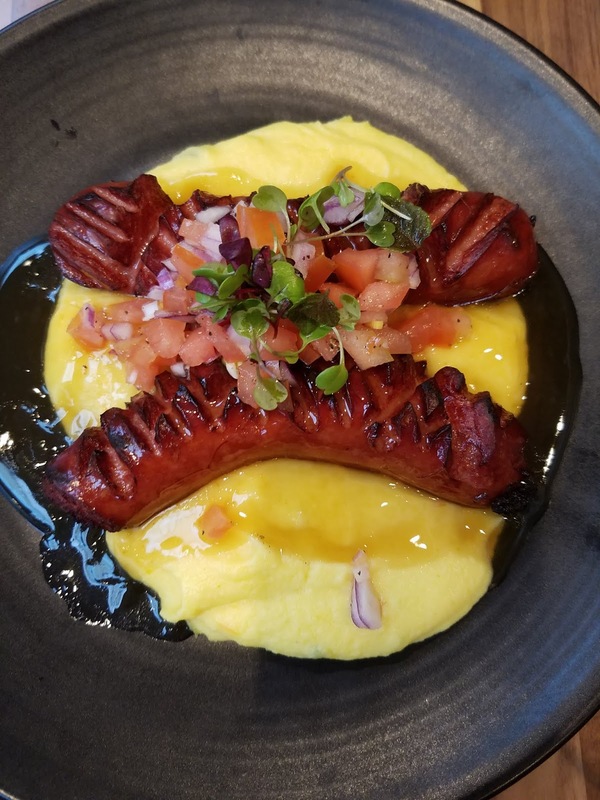 Zazou, in Redondo Beach, was one of my favorite restaurants when I lived in the South Bay, and one my first night back, I decided to go with a place I knew, even if it had changed. 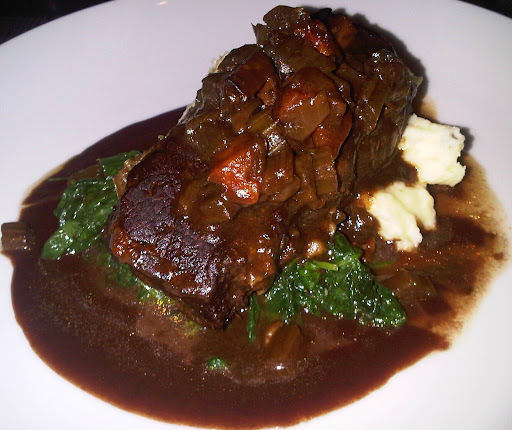 I chose the 8 hour braised short ribs with mashed potatoes and sauteed spinach for $29. It was a beautiful LARGE plate and I looked forward to my first taste, but unfortunately the meat was not as tender as an eight hour braise should have made it. The flavors were good, not outstanding, but a decent blend of reduced beef stock. The fresh spinach saute and potatoes were both fine side dishes and the carrots and onions from the braising liquid added a nice textural component to this dish. This plate was so large, I could only eat half of it! My waitress was so wonderful she laughed when she asked if I wanted dessert, seeing I had left so much of my main course on the plate. I told her no dessert, but a decaf espresso would be great. 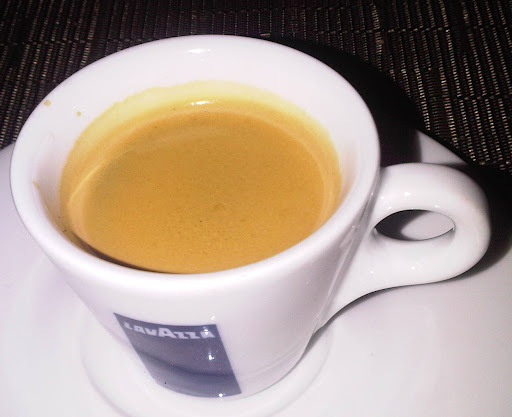 The decaf espresso was great, with perfect crema and made with excellent Lavazza beans. I went to Paciugo Gelato, in Hermosa Beach, for my dessert since it gave me time to drop off my leftovers and walk off some of my dinner. 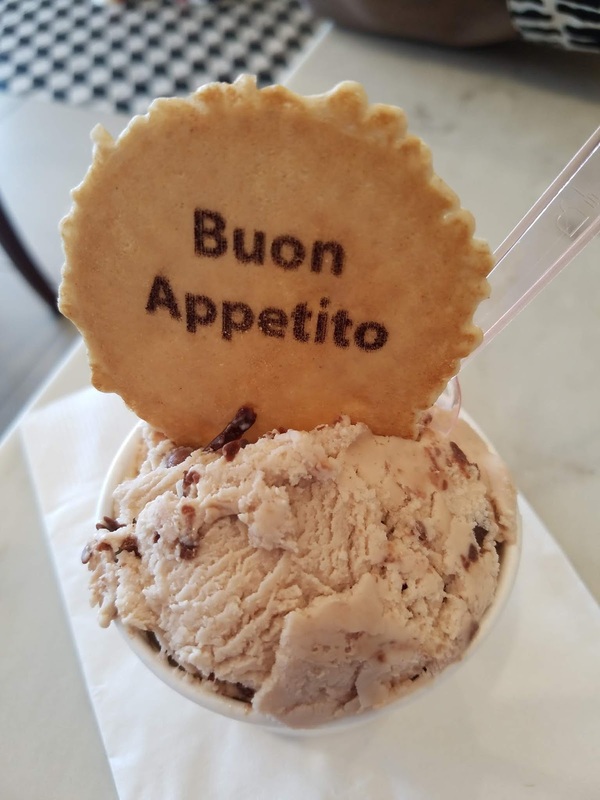 I love gelato and to have a place in Hermosa that does it well was one of the changes I loved finding in my old hometown. A small cone or cup can hold up to three flavors for under $5, with exotic options like strawberry lavender, wedding cake, and black pepper olive oil, you can chose something new or in my case, two old flavors, like coconut chocolate rum and extra dark chocolate. 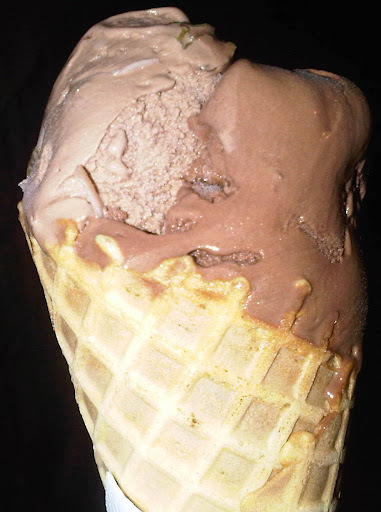 The perfect way to end a day is with a stroll along the beach and a cone of excellent gelato! 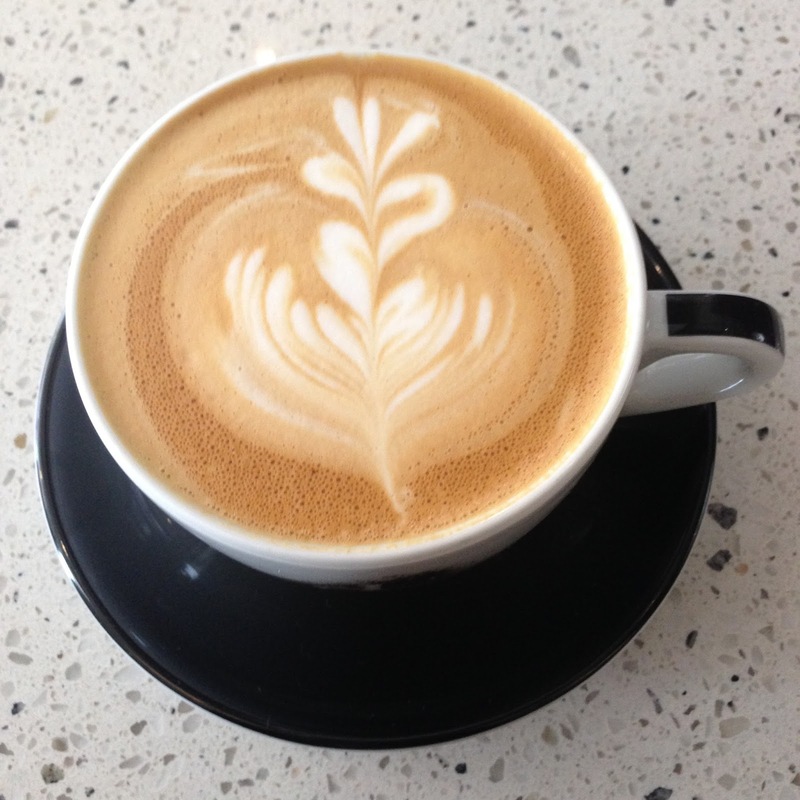 A new day meant finding a great coffee place to start my day and it looked like Two Guns Espresso in Manhattan Beach was THE place to get something called a “Flat White”. They use 3 shots of espresso and 6 oz of steamed milk (I got soy) for this smooth nonfrothy drink. I loved it. 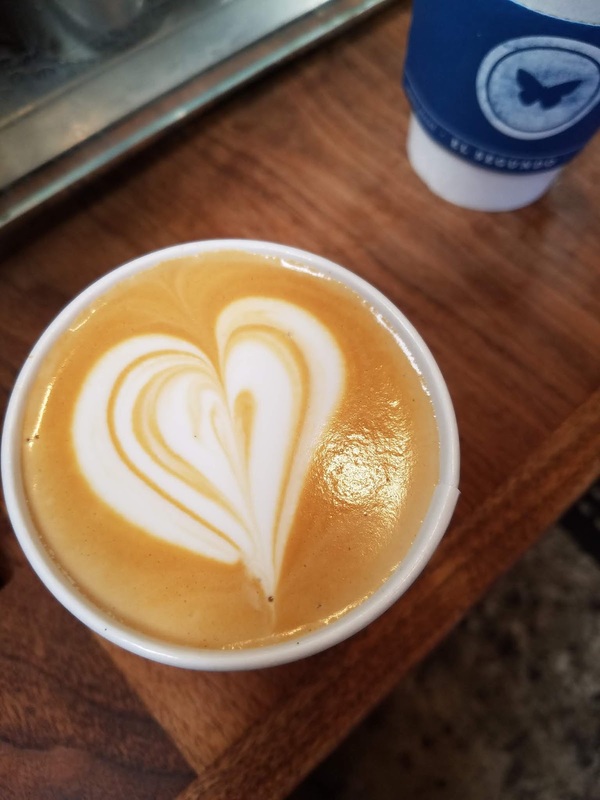 I especially loved the friendly baristas and the fact that they use Caffe Vita beans from Seattle which emphasize Fair Trade and Organic beans. If you frequent the area (or their shop) get a frequent user card and get a free drink after buying nine. The first Tuesday of every month is Ducati night when you can drink free coffee as you peruse the latest models of this classic Italian motorcycle. After my Flat White at Two Guns Espresso, I really didn’t need anymore espresso, so even though they had organic coffees and teas, I opted for a light but sustaining breakfast, so I went to Planet Earth in Hermosa. I chose their house made granola with soy milk for $5.95. 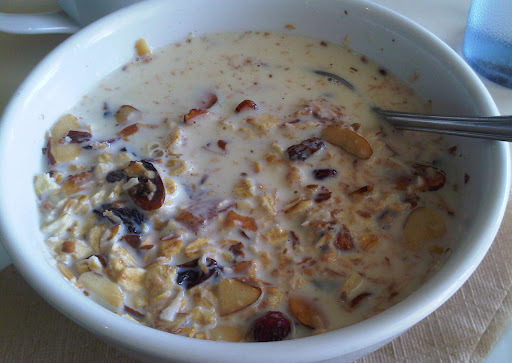 It was delicious, with bits of dried unsulfured apricots, cherries, coconut, and almonds. They have plenty of options for vegans, those who are dairy or gluten sensitive, and anyone who wants their food to be organic, free trade, and home made. The only drawback to the place is that they are so disorganized they had trouble keeping up with orders and ran out of ingredients like bananas for my granola by 10 am. One customer waited 20 minutes for eggs, another waited 10 minutes for a quinoa bowl. Since most people don’t have the luxury of time for breakfast, especially on a weekday, they need to work on their executions and supplies so their mises (preparation of their ingredients for the dishes) are en place (ready). No matter how good their intentions and supplies, they will not survive without better organization. 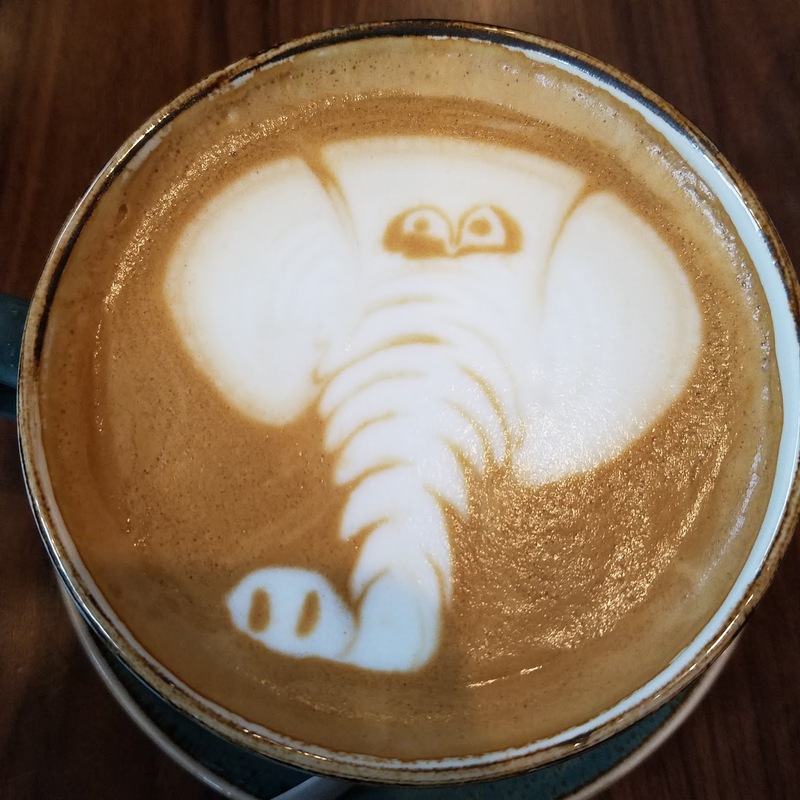 There are very few places I will drink coffee in the United States; Urth Cafe and The Conservatory, are my local favorites. I recently discovered Jameson Brown in Pasadena, and after just two visits, it has risen to the top of my favorites list. Like the Conservatory, they roast their own beans, and like Urth Cafe, they offer good pastries and snacks with their coffee. All three of my favorite places offer organic teas and water process decaf for those of us who are sensitive to the pesticides found in most commercial products. There is plenty of easy street parking and a few outdoor tables. Inside, the brick building is bright, open, and inviting, with a couch, a fireplace and WiFi for those who want to stay awhile and work or study. Friday and Saturday nights they have musicians who play for food and coffee, so this can be your local live entertainment spot. One of us got the regular latte and even though I preferred my Mayan Mocha, this was an excellent version of the classic coffee drink. For those who want other unusual variations, they also offered a snowball (made with coconut and white chocolate), and a lavender latte, and even the largest of these inventive drinks is less than $4.50 each! Their special drink this week is an iced latte horchata. 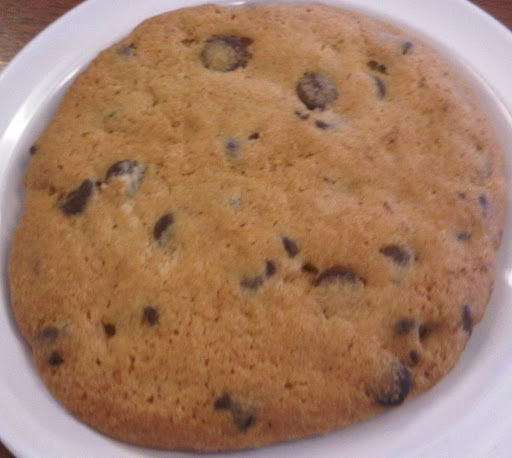 Their chocolate chip cookies were a decent version, not as decadent as Madame Chocolat‘s, but also not as boring as commercially made ones. 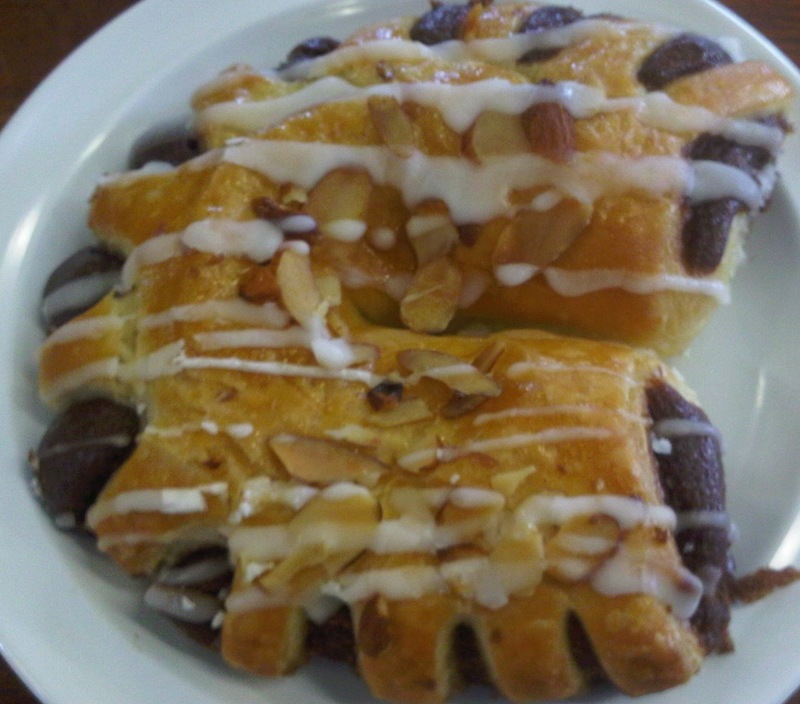 The bear claw was am excellent breakfast pastry, with a nice almond paste and streusal interior. For those wanting less sugary snacks, they also serve bagels and Romanian flatbread, which is similar to a large savory tortilla. 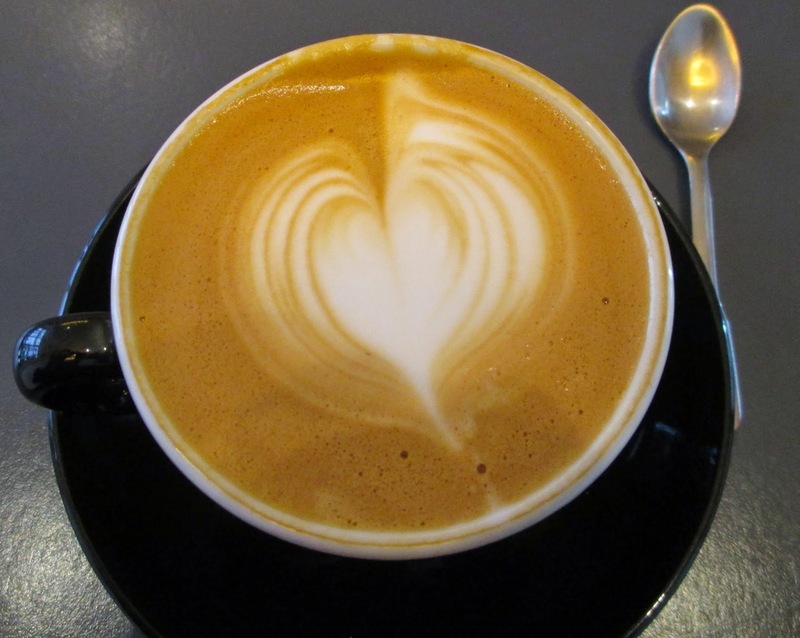 Jameson Brown offers everything you could ask for from a coffee house, quality ingredients, skilled service, a welcoming atmosphere, and that rare ingredient found in all great establishments, a commitment to always doing their best.